Difficulty Notes: It’s hard to rate this trip. It’s obviously a huge objective both distance and elevation-wise but fairly easy technically if dry. I’m rating it as “easy alpine”. 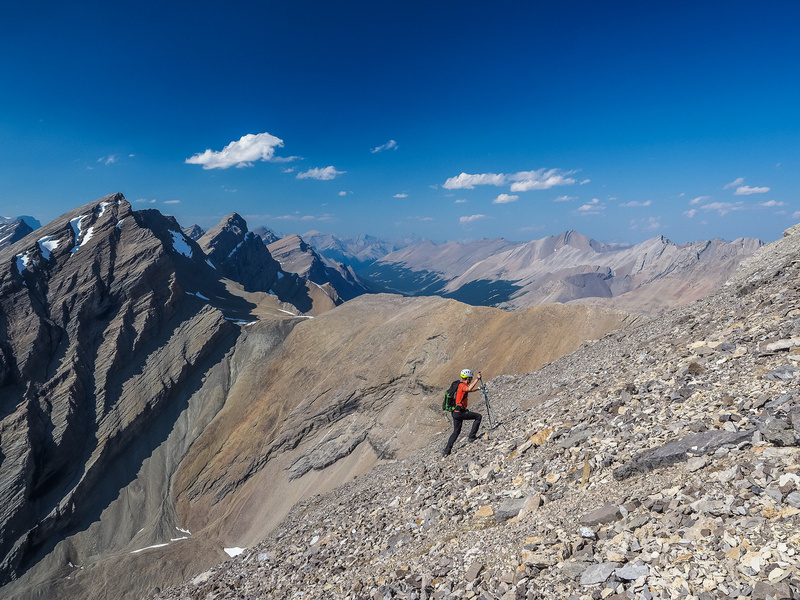 I capped an awesome 9 days off in July 2017, with a long-sought adventure up the distant, obscure and somewhat neglected Cataract Peak, just across the Pipestone River Valley in Banff National Park. 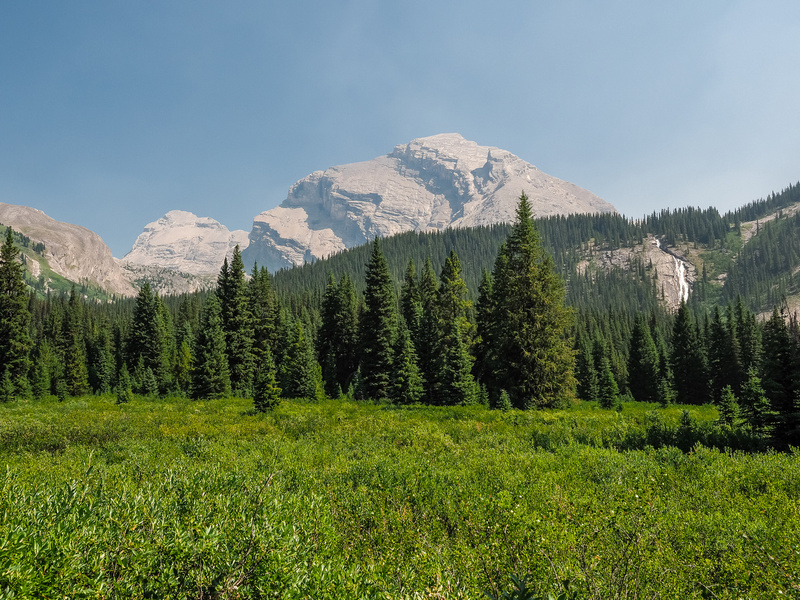 This mountain has been on my radar for many years now – mostly because it’s high (almost 11,000 feet) without being so high that it gets more attention (i.e. 11,000 feet). When Ben and Steven did it back in September of 2014 I was fairly bummed that I didn’t get to join them. Since then it became very slightly more popular than it was before, with at least one or two ascents made using their excellent beta. This had a reverse effect on me, pushing the mountain down my priority list a bit. 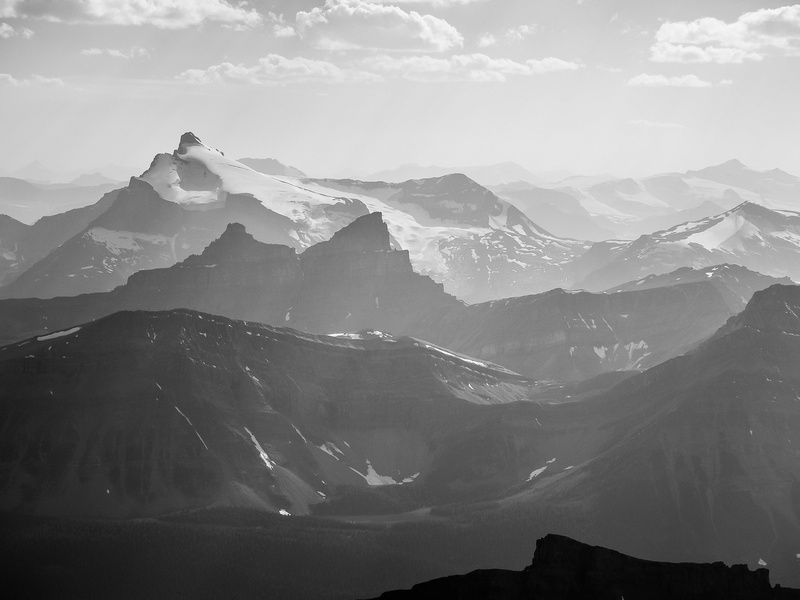 The last few years have seen many of my long-sought peaks climbed by friends and acquaintances. Often I’ll try to wait a few years after a more obscure trip that I’ve wanted to do is published by someone else – to let the beta and fresh images from others’ fade from my awareness and have a fresh experience myself. Cataract was one of these objectives for me. After Raf and Ferenc did the peak in 2015 and no one in my social circles did it in 2016, I knew it was time to put it back at the top of my own priority list before someone else put fresh images back in my consciousness! 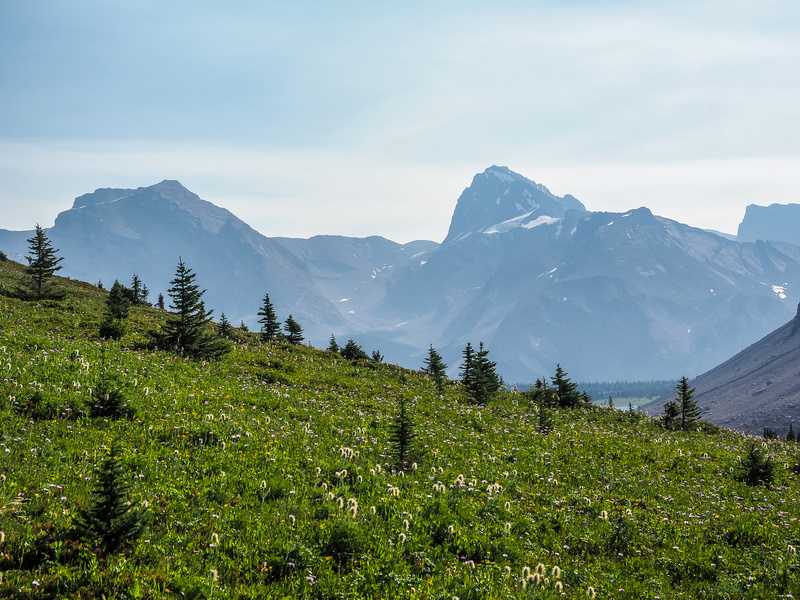 After just completing a fairly energetic day on South Totem and Spreading Peak two days previous, it was a familiar early morning pickup at Phil’s Canmore residence before driving up hwy 93 to the Mosquito Creek / Hostel parking lot. The lot was packed right full, with people even sleeping in their cars. 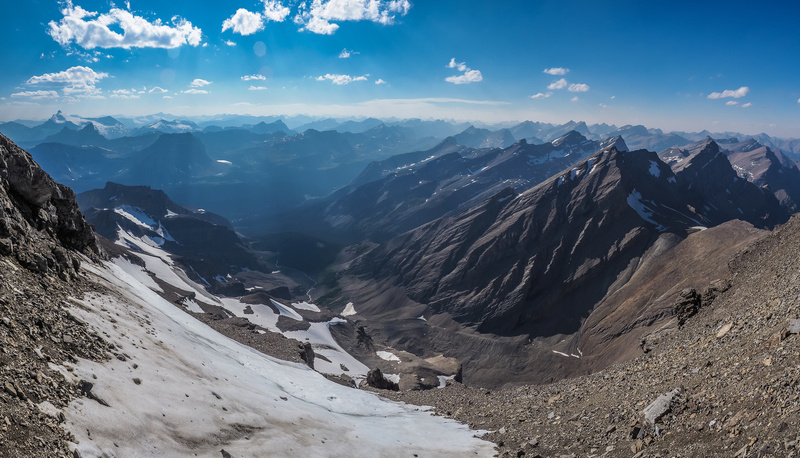 High summer in the Canadian Rockies I suppose. 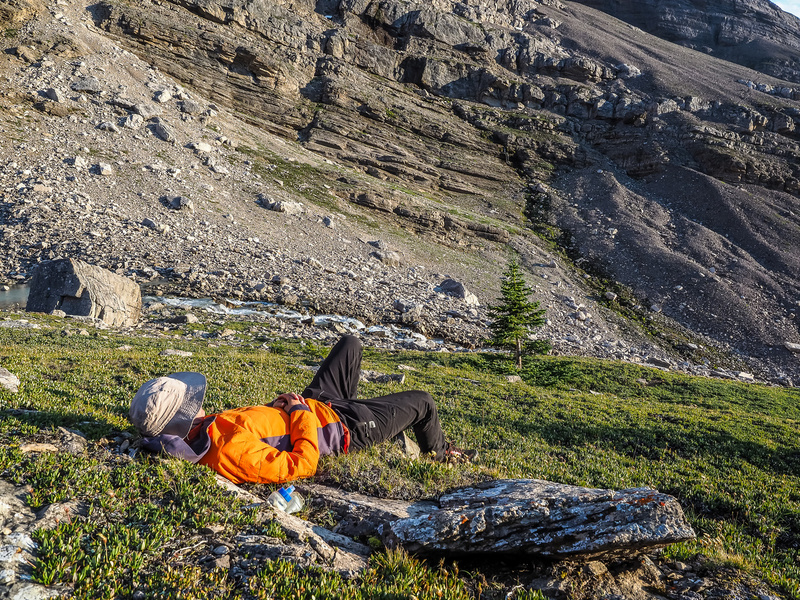 We had a long day ahead of us, with good intentions to ascend Molarstone Peak on our way over North Molar Pass before making the high bivy under Cataract. This meant at least 1500 meters of elevation gain and over 23km of distance on our first day. 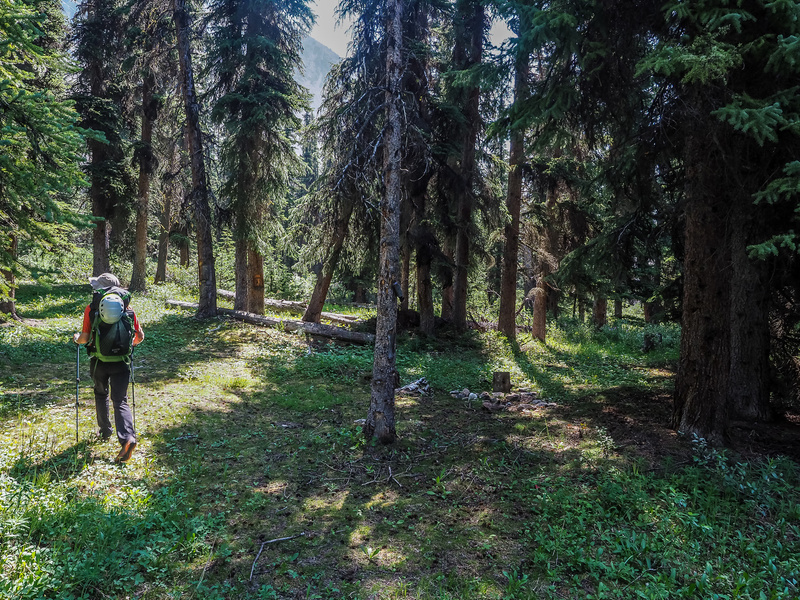 We didn’t linger in the parking lot very long before shouldering our light overnight packs and marching up the Mosquito Creek Trail – a very familiar one to me but completely new for Phil. I’ve traveled up Mosquito Creek both in summer and winter, multiple times for objectives such as Mosquito, Quartzite, Ramp and Mount Willingdon. 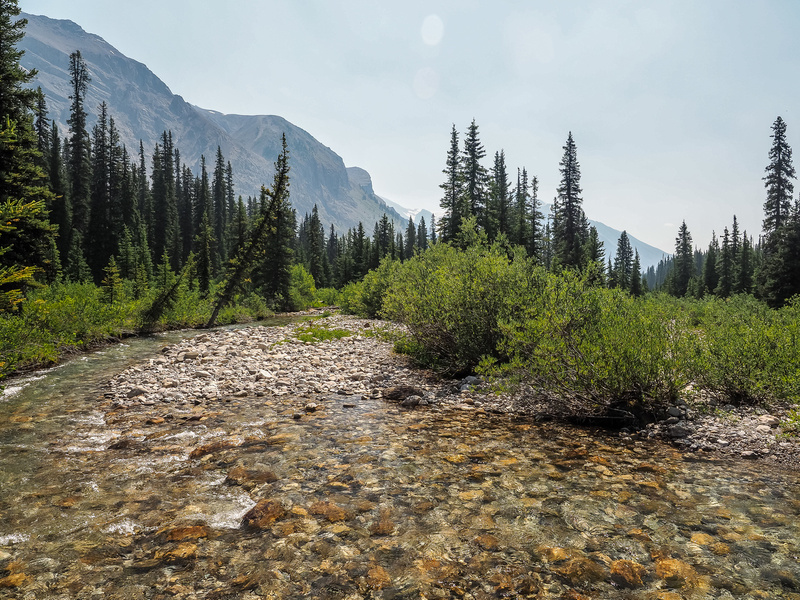 Despite all these trips up the creek (so to speak), I’d never gone beyond Mosquito’s lower slopes towards either North or South Molar Pass and was looking forward to the new territory. I was not disappointed. 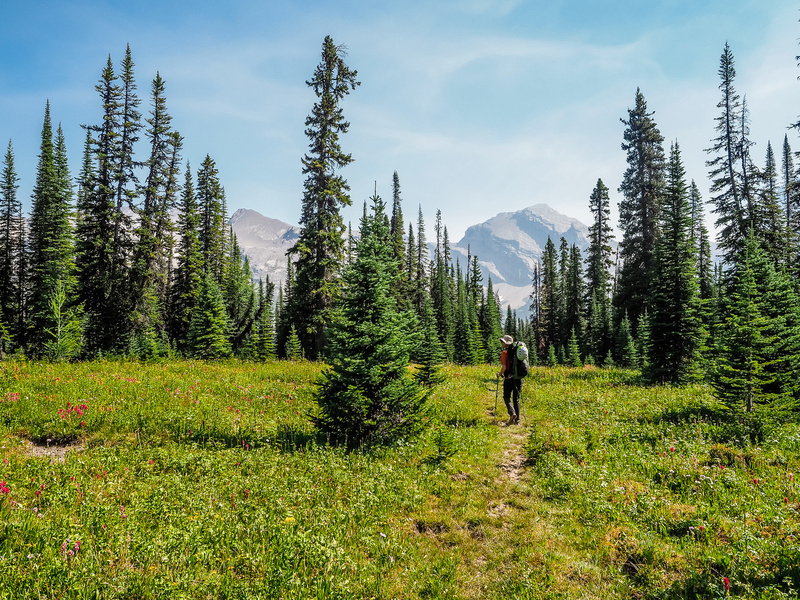 As we hiked through thinning trees towards North Molar Pass, we started noticing carpets of wildflowers in open meadows in the forest around us. 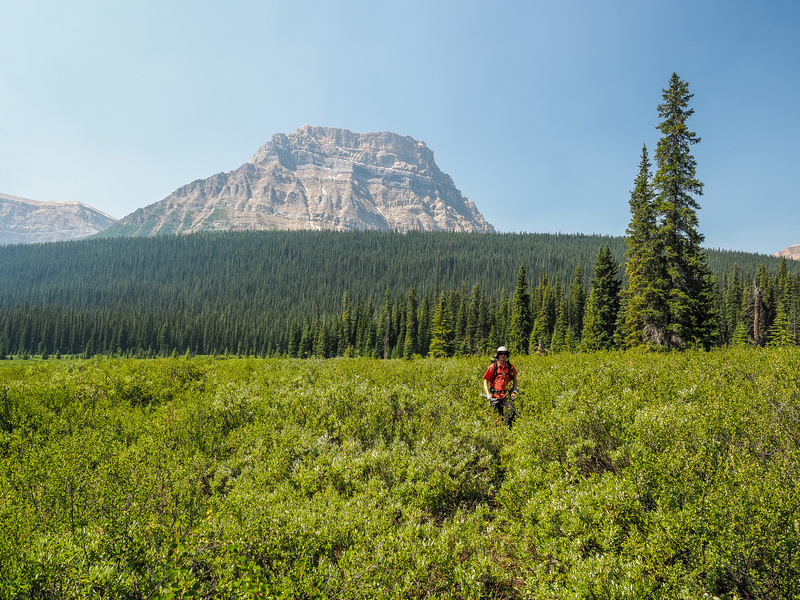 No big deal until we started exiting treeline and the carpets of wildflowers became acres of them! As expected, there was a smoky haze in the air, but somehow that seemed to bring out the vibrant colors of the various types of flowers and added a mysterious quality to the landscapes rising beyond their grasping roots. We both spent the next hour or so up to North Molar Pass, unable to put our cameras down. The prolific displays of color and landscape scenery was mind-blowing and a bit overwhelming. The micro scenery of green and color in the foreground with macro scenery of steep cliffs coming off of Noseeum Peak and outliers of Molarstone was off the charts. 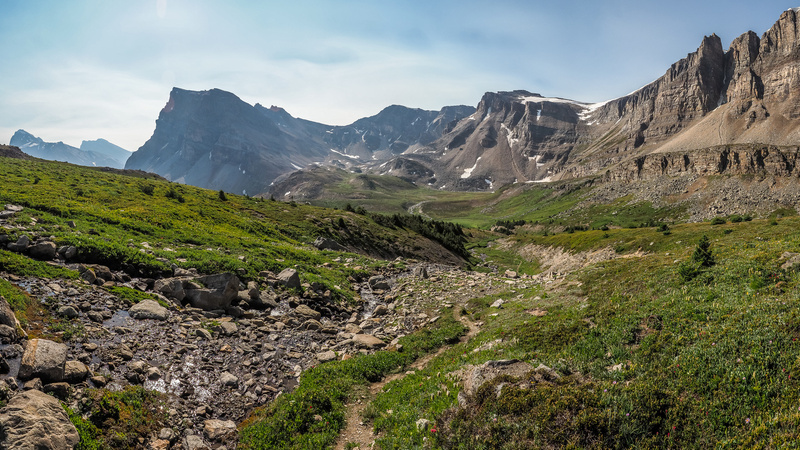 I could have spent the entire day below North Molar Pass and had one of my best hikes to date. But we had much, much more to do yet this day and continued our forward march. 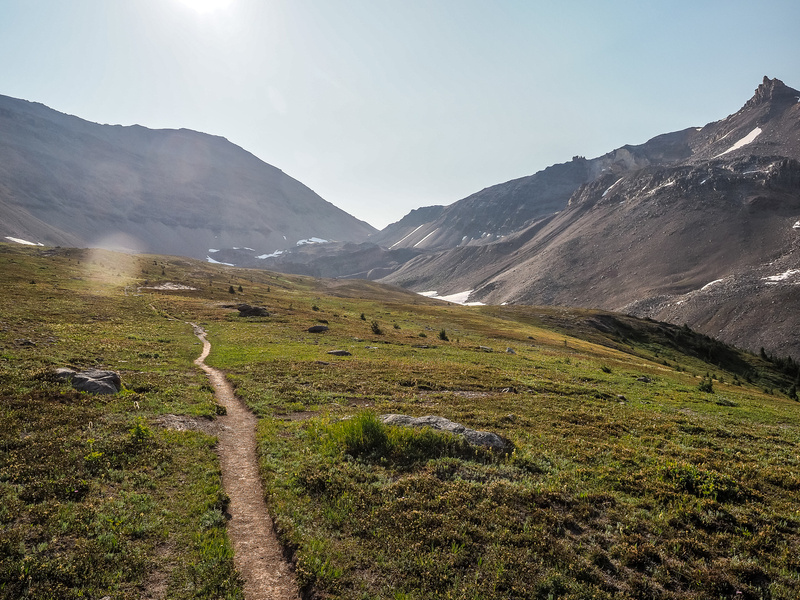 Pure hiking magic on the North Molar Pass Trail. 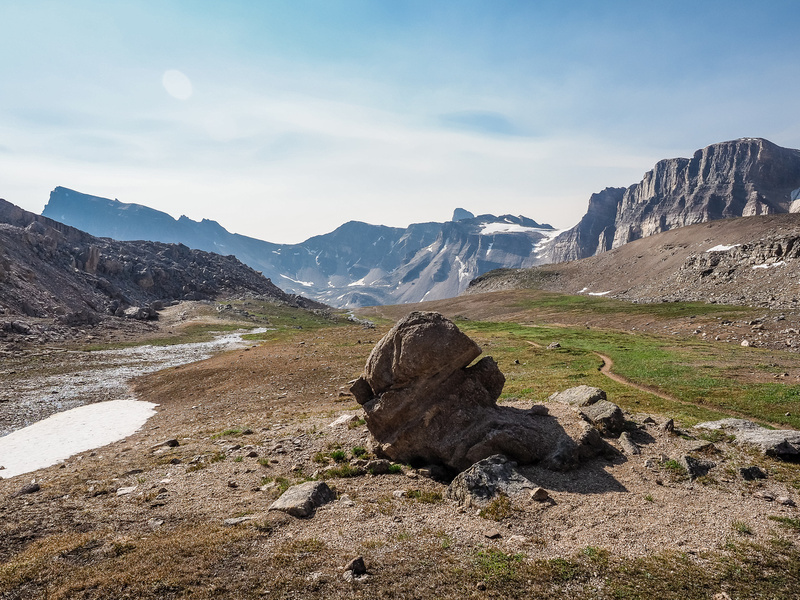 As we approached the steep trail winding its way up through stubborn snow patches towards North Molar Pass, I started thinking that maybe our idea to nab Molarstone Peak on the approach was a mistake. 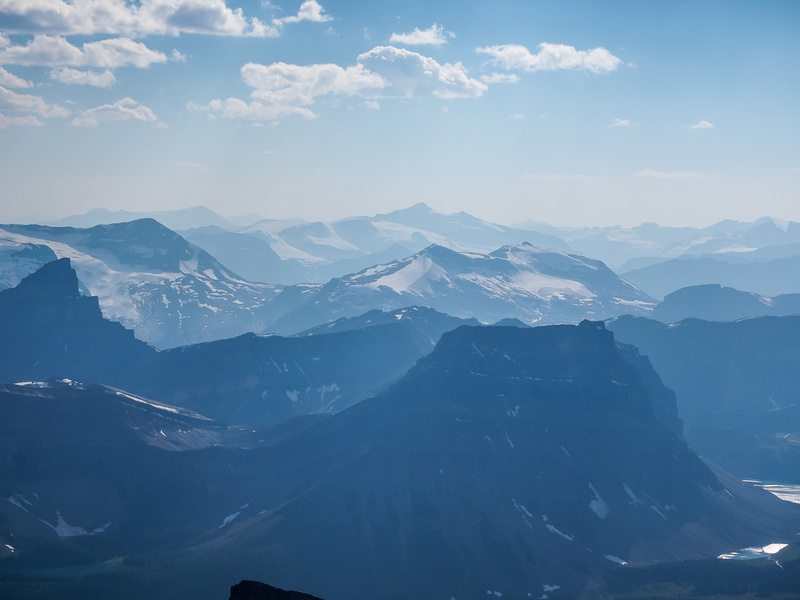 The weather was perfect and despite the growing forest fire haze all around us, I wondered aloud to Phil if we should power over the pass and make Cataract’s summit a goal for our first day instead of Molarstone’s? Of course, Phil being Phil, he agreed right away with this more aggressive plan. We were motoring along at this point and both feeling great, so why not? I’ve climbed many summits on the afternoon / evening of approach day and it makes good sense with stable weather and positive mindsets. It certainly makes for a more relaxing second day! 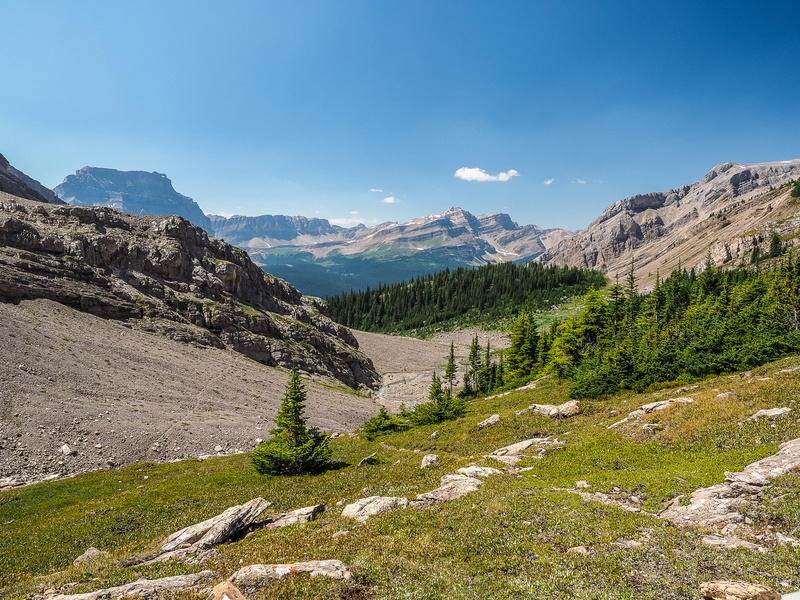 Three hours after leaving the Mosquito Creek parking lot we were enjoying the stunning views on both sides of North Molar Pass, having gone over 11km and around 800m of height gain already for the day. 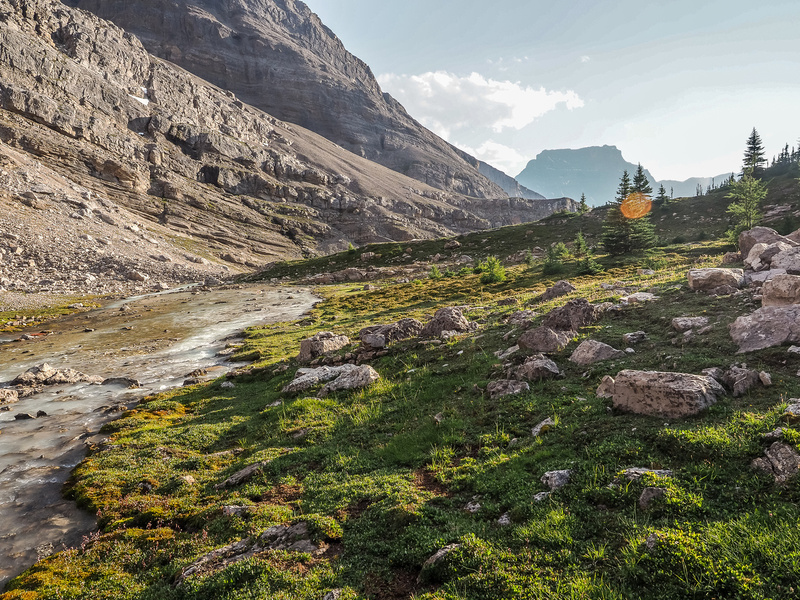 The trail continues to wind it’s way down valley – Fish Lakes still out of sight at lower left here with Minnow Peak rising at left above them. 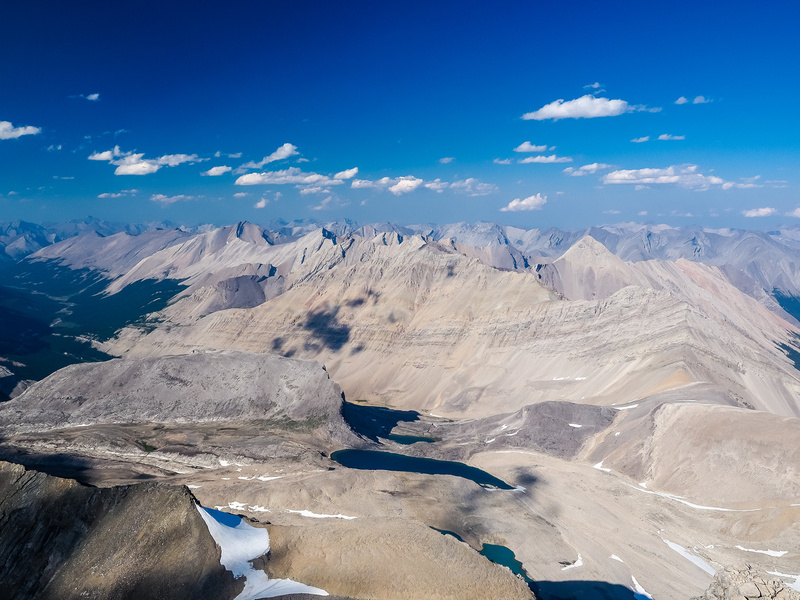 From North Molar Pass we had the depressing task of descending 600m past the lovely Fish Lakes to the Pipestone River Valley before finally regaining hundreds of vertical meters in a bushwhack to our planned bivy site. Oh – and then presumably hundreds more meters of ascent up Cataract Peak itself – almost as an afterthought to the approach. (To be frank with you, sometimes I wonder what goes on in my brain when I’m not looking.) 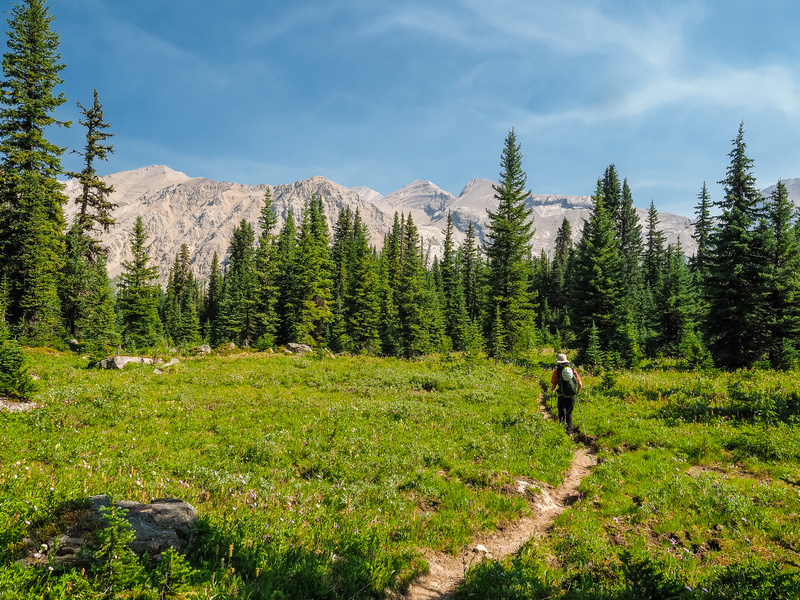 As depressing as it sounds, the hiking from NMP down to the Fish Lakes Campground was positively sublime. There weren’t quite as many flowers as in the alpine meadows above Fish Lakes, but the combination of wild streams, impressive rock walls plunging from unnamed summits north of Molar Mountain and the hazy outline of Cataract Peak rising in the distance over a shimmering Fish Lake gave us existential goosebumps. 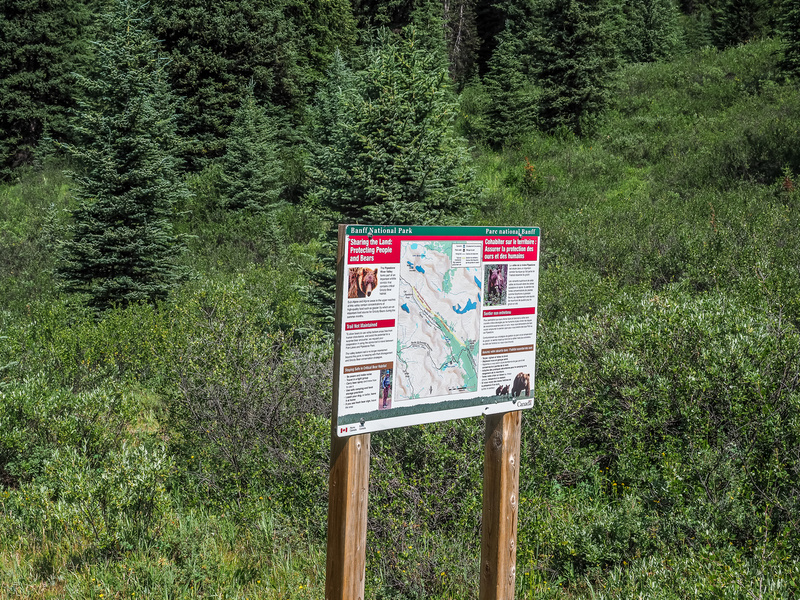 Marmots serenaded us as we quickly descended down the braided trail to the very buggy Fish Lakes campground. 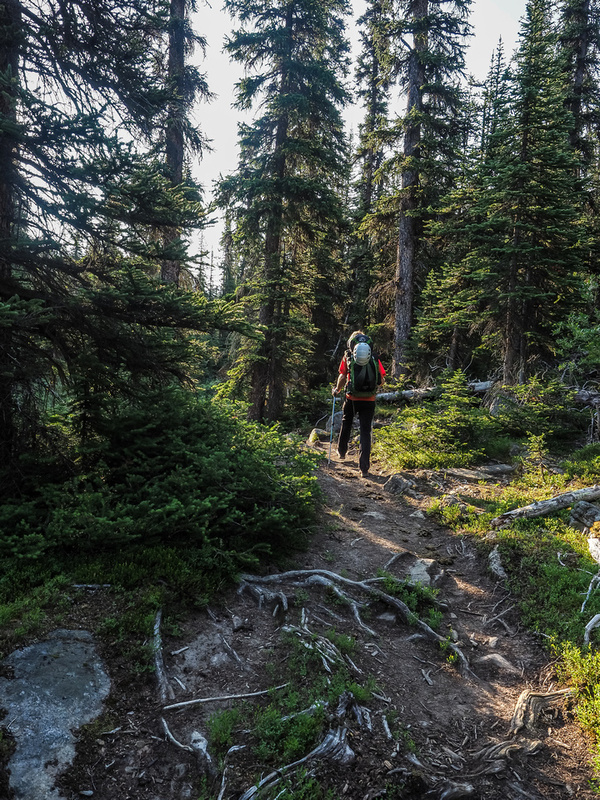 We only briefly stopped here as the mosquitoes and flies were very aggressive – remember to bring spray and bug nets if you ever visit this area or you might not enjoy it as much as you were expecting. Elevation Profile of the Cataract Peak Approach. 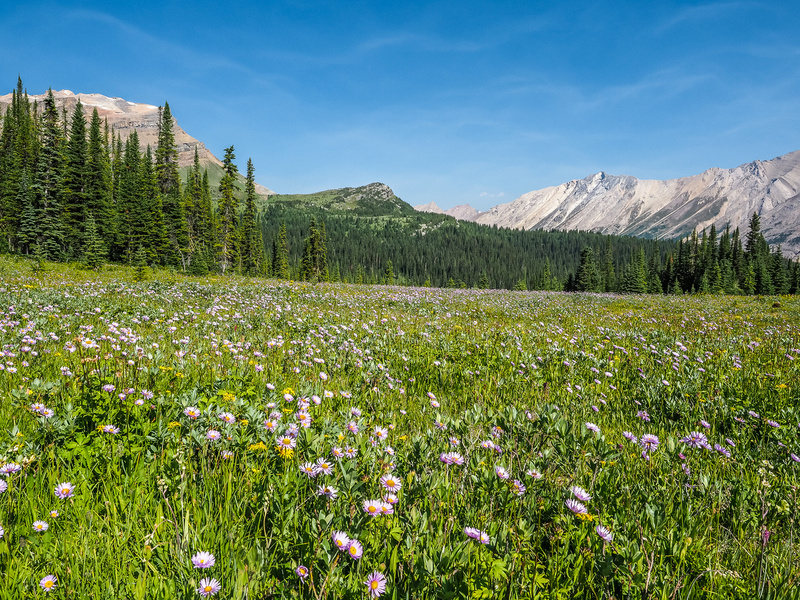 Acres of Asters flourish just past the Fish Lakes Campground on route to the Pipestone River. 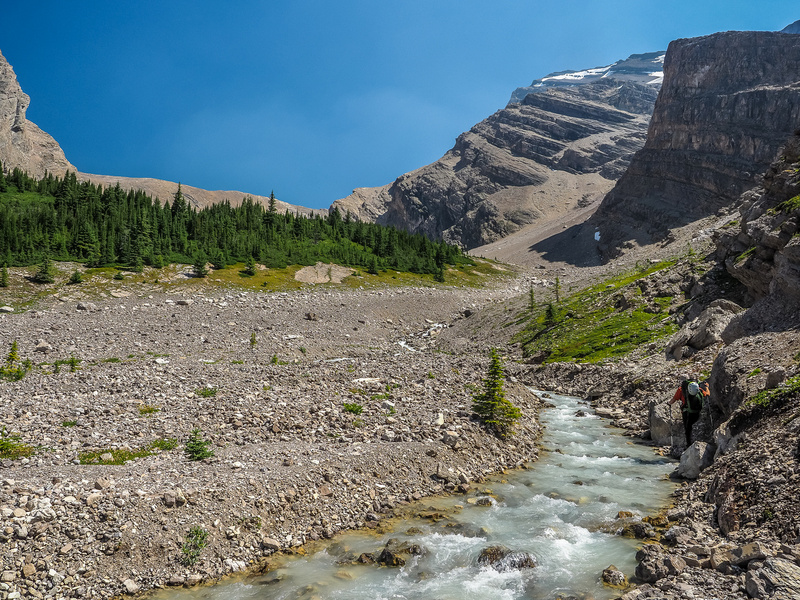 From the Pipestone River we followed a much smaller trail through heavy growth at valley bottom leading south towards a distant Drummond Icefield and Molar Creek. 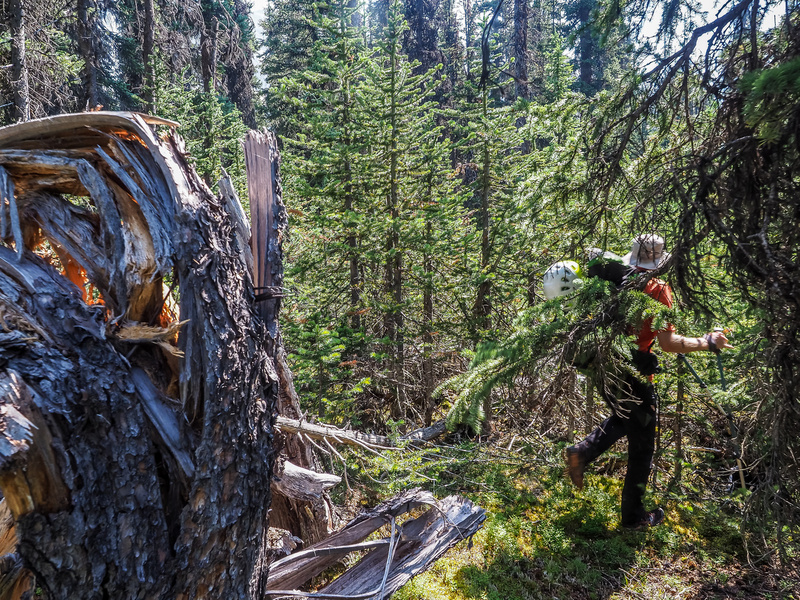 After following this trail for only a few hundred meters it recrossed the Pipestone and we bid adieu to the trailed section of our approach, cutting through forested slopes on our left, leading to Cataract Creek and our mountain. It took us 5 hours to reach this spot in which we traveled 19km, ascended 800m and lost another 600m. We both felt great at this point – nature was replenishing our minds and bodies as fast as we were draining them. We crossed some low brushes residing on some river flats, and even had to take our shoes off for another creek crossing (Three Brothers Creek) before finally getting into light forest just beneath the “Cataract” and Cataract Creek. An interesting clearing in the trees belied the remoteness of this location. 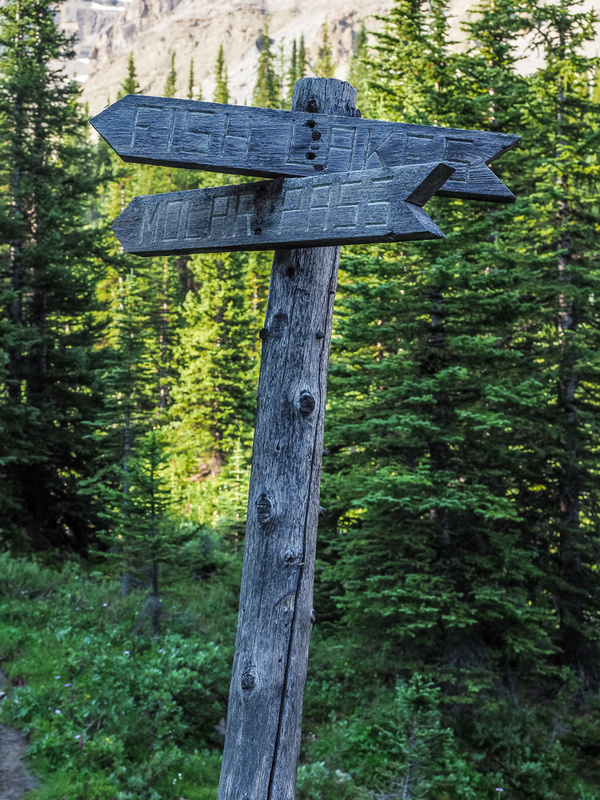 Initials were carved into the trees here and I even found a canister of bear spray hanging innocuously from a rusty old nail in a tree nearby – a bit creepy! There’s untold stories in this area, I’m thinking. Who set up camp here, and why? When? Ferenc and Raf and come across an old cabin somewhere nearby. Obviously this must have been an active hunting or exploration camp at one time or another. 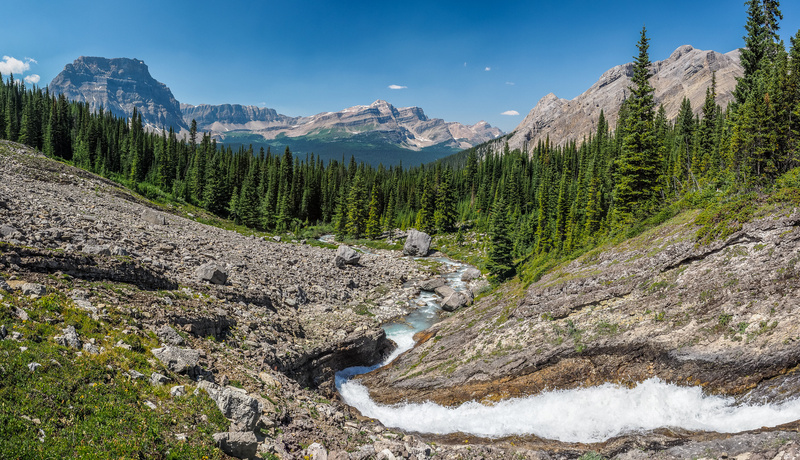 Three Brothers Creek drains Three Brothers Lake, which is situated between Deluc Peak and Little Cataract. 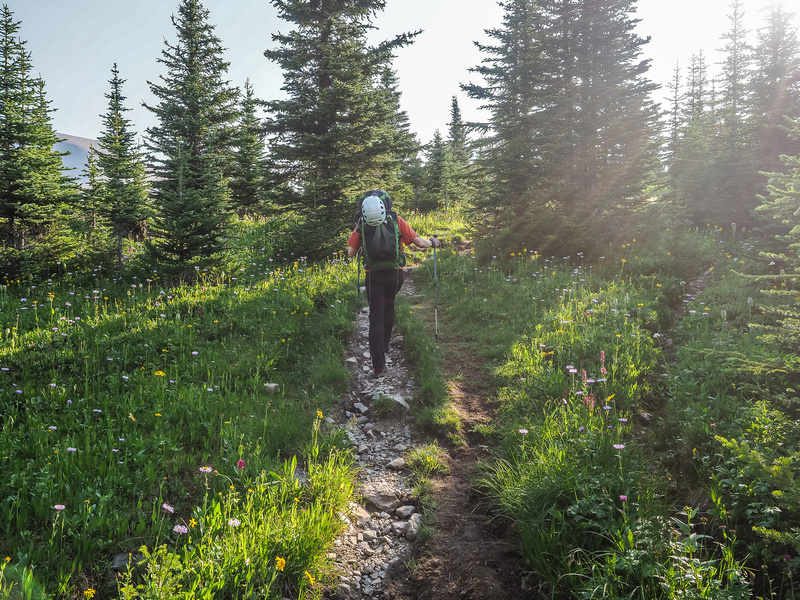 We followed the terrain up very steep, lightly forested slopes on climber’s left of the creek before contouring right and walking right next to the lively watercourse. Trees started to thin again and before long we were approaching treeline for the second time this day. We crossed the creek on a natural bridge made of 3 huge boulders before starting to search for an appropriate bivy location. We were right under the lower ascent slope on Cataract before we finally settled on a small ridge with some exposure to the breezes to keep the local bug population away. 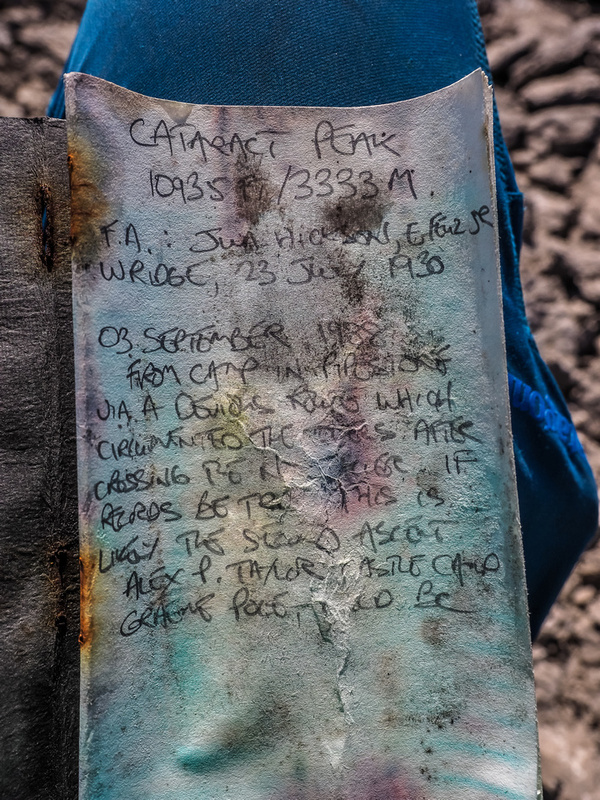 Continuing on towards our bivy site – we almost camped here but the ground was too wet. Little Cataract at center with big Cataract at right with snow patches visible. 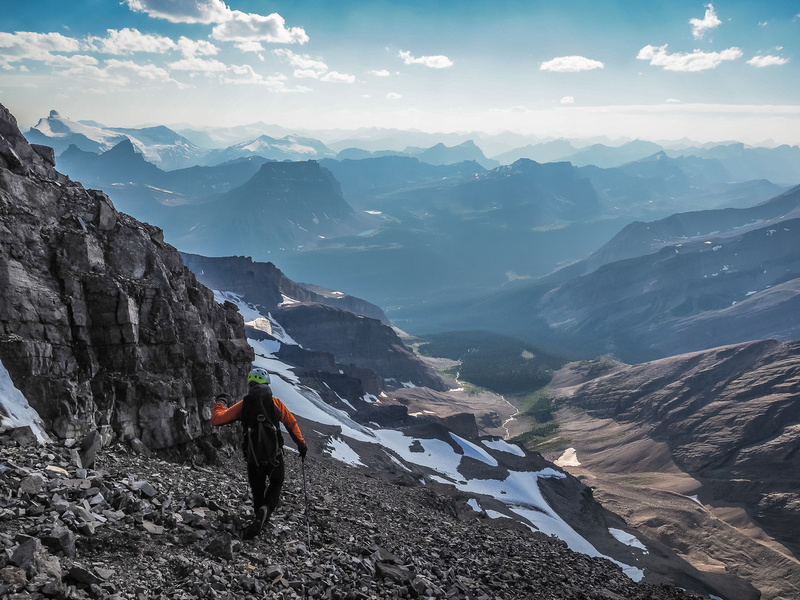 It had taken us only 6.5 hours to trek the 22km and over 1200m of height gain to our bivy – much quicker than we expected. This was great news, as we now had at least 8 hours of daylight left to climb our peak and get down before dark. 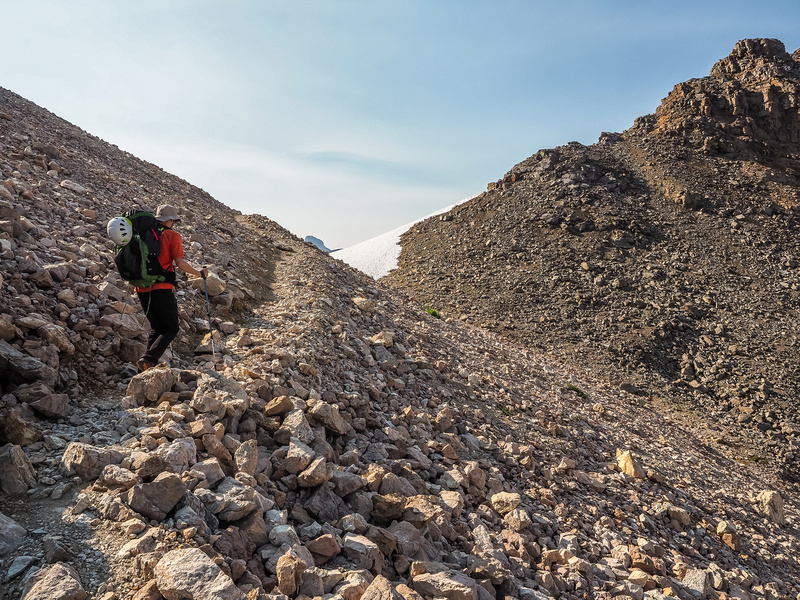 After setting up our bivy and emptying our packs of any extraneous gear, we filled up our water bottles (it was quite warm) and marched off towards the hulking mass of our mountain, looming over our bivy site from the east. It's going to be a lovely, lovely day. 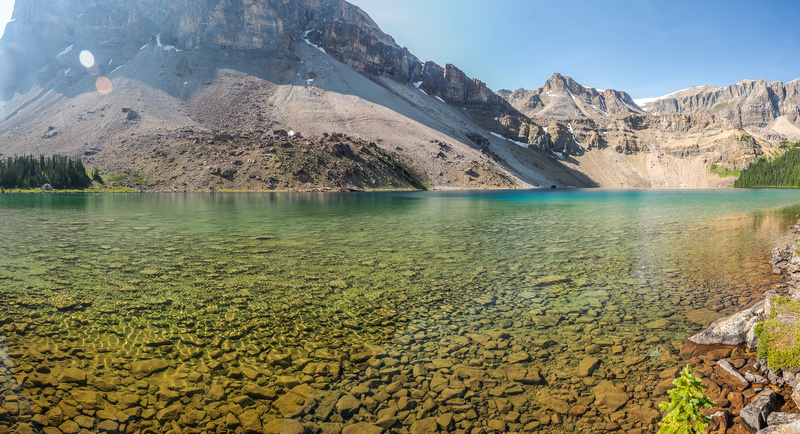 "Fish Lakes" is North Molar Pass, "Molar Pass" is South Molar Pass. 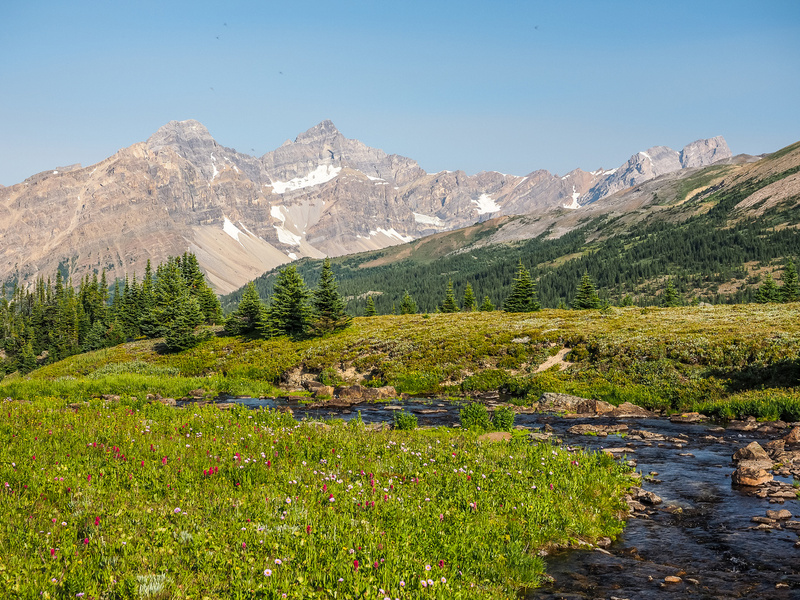 Mosquito Creek flows out of it's headwaters tarn in this view looking back towards OXO Mountain. 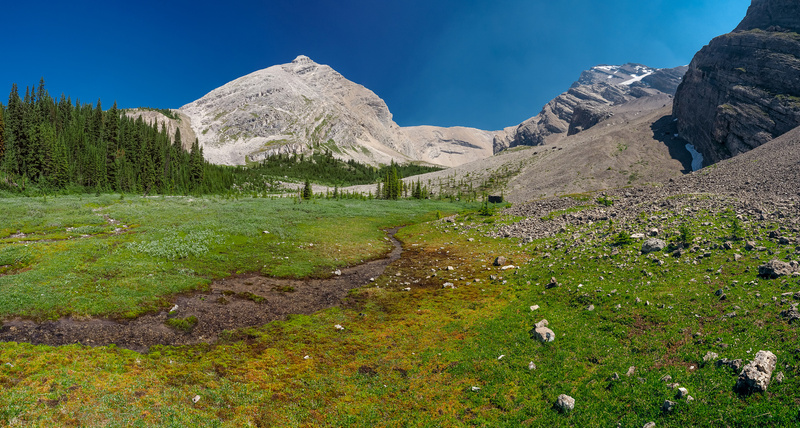 The small tarn that is the start of Mosquito Creek with the impressive NE face of Noseeum Mountain rising beyond. Looking ahead to North Molar Pass from near the tarn - Molarstone rising at left. View looking NW along our approach from way down the valley and out of sight around Noseeum Mountain at left. Striking landscapes as we descend the alpine valley towards Fish Lakes. The trail continues to wind it's way down valley - Fish Lakes still out of sight at lower left here with Minnow Peak rising at left above them. Finally Cataract Peak shows up right of center. It looks far and huge from here yet. An energetic stream flows down towards the Fish Lakes. Deluc Peak rises in the far distance through the forest fire haze. Little (L) and "Big" Cataract Peak rise across the Pipestone River Valley and over the larger of the Fish Lakes. The Fish Lakes Campground is gorgeous - but beware of the hordes of bugs that also happen to find it incredibly attractive. 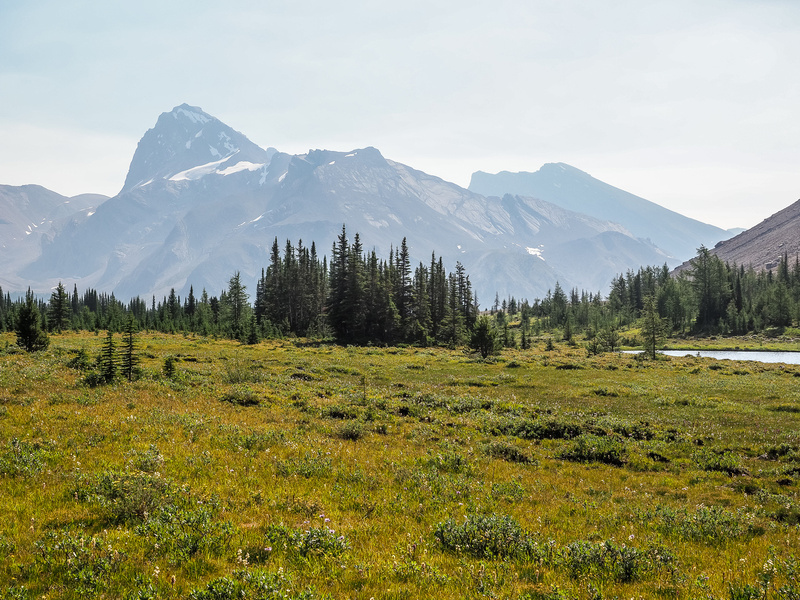 The view of Cataract (L) and Mount McConnell from the meadows around Fish Lakes. Acres of Asters flourish just past the lake. A perfect day not to be working or doing anything but exactly this. Descending from the Fish Lakes to the Pipestone River. At the Pipestone River crossing. The low brush / river flats section where we crossed another creek requiring the shoes off. The "Cataract" namesake at distant right with "Little" Cataract rising beyond. Looking back at Phil crossing the flats. The sort-of-creepy clearing that has obviously been used as a camp more than once over the years, possibly by folks exploring and climbing along the Pipestone River Valley. Nearing treeline again, Our peak back in view and looking distant and huge. Looking down Cataract Creek towards a now very distant Molarstone at center. 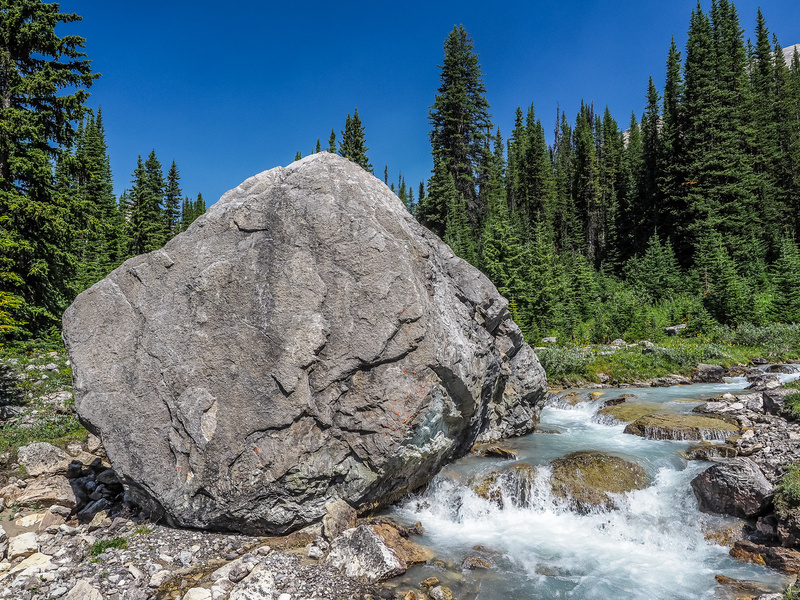 Massive boulder channeling Cataract Creek. Continuing on towards our bivy site - we almost camped here but the ground was too wet. Little Cataract at center. The treed ridge in the distance was the one we finally ended up bivying on - it was the last of the trees too. 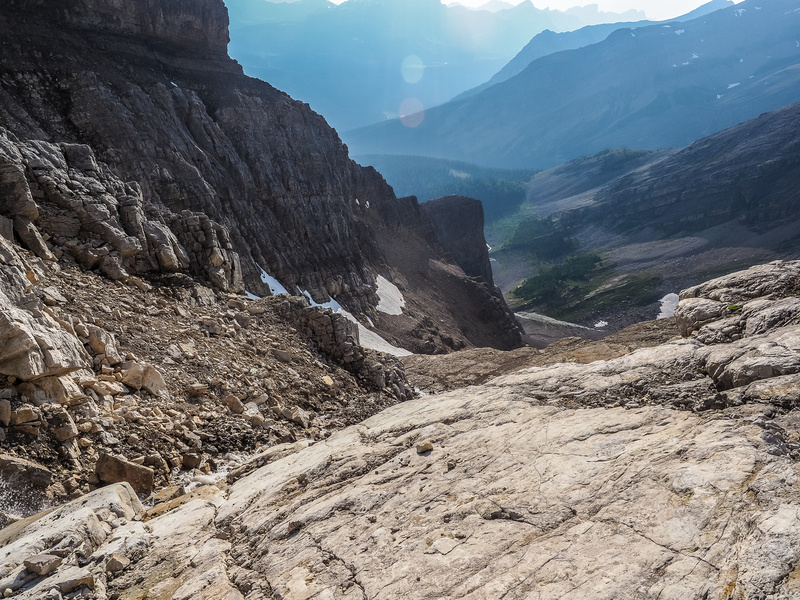 The views back down valley over the Pipestone and towards a now very distant Molarstone from our bivy spot. 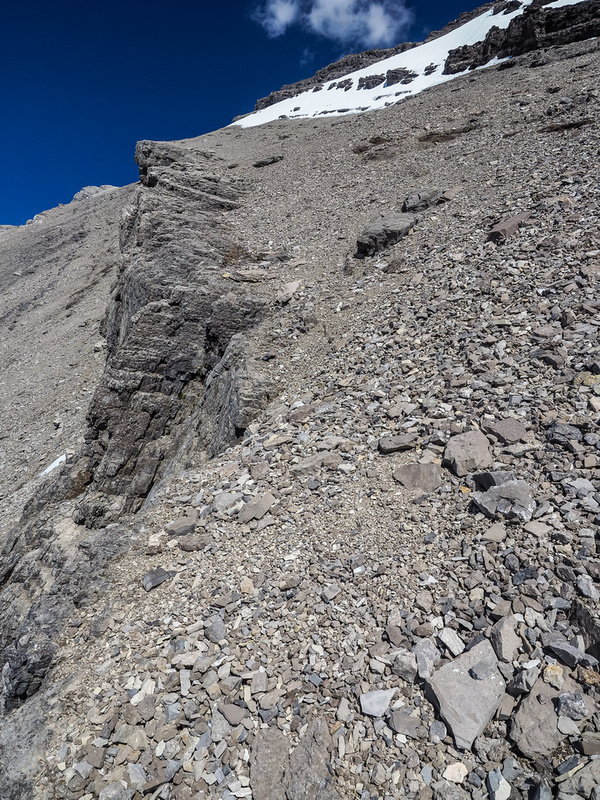 From our bivy we could see a possible hazard in the form of a stubborn snow / ice patch high up on the infamous scree bench traverse to the summit. I was more than a little nervous as I gazed up at this spot as I’d taken some risks on bringing very light gear for this trip. 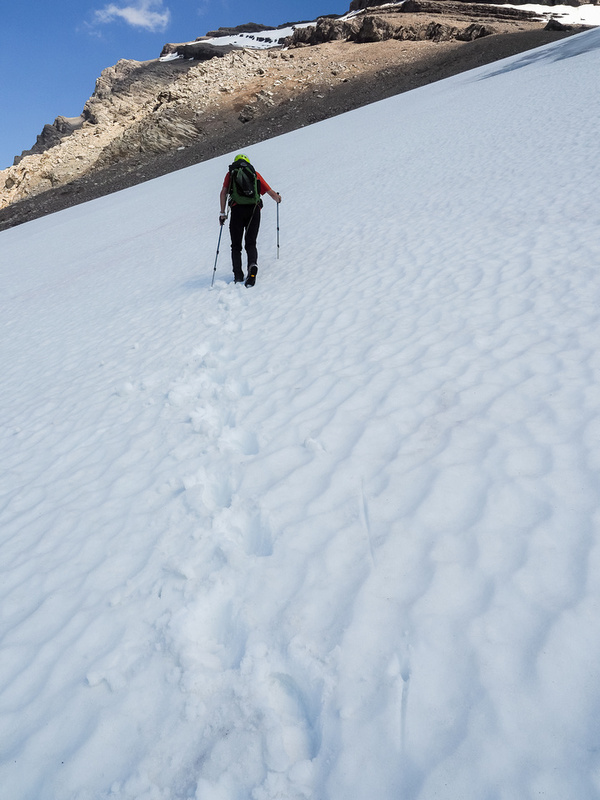 I had only approach shoes, aluminum crampons and a light alpine ax. 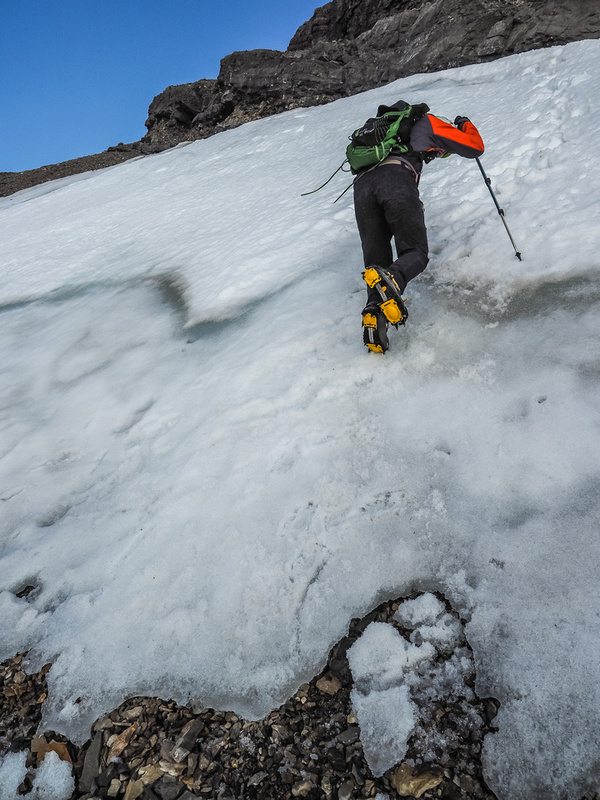 Phil had foregone the ax but had boots (he wore approach shoes and carried the boots on the hiking sections) and steel crampons. 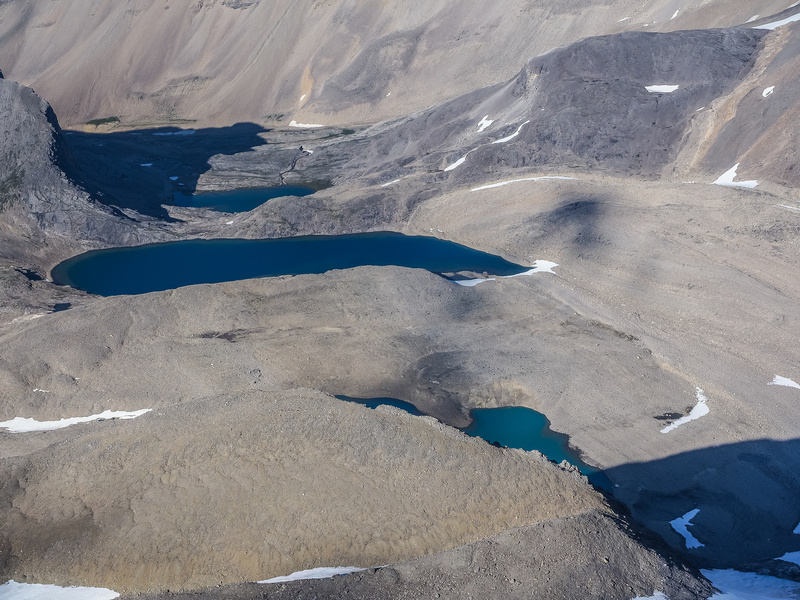 I had some beta from Raf that indicated a possible scree run down from Cataract’s small glacier down the north side of the mountain. I had severe doubts that there was a magical route that everyone else had missed seeing over the years, but we decided to check it out just in case. It was disappointing to realize there was no possible route through the curtain wall of cliffs surrounding the north end of Cataract, but at least we didn’t waste more than 40 minutes with this side trip. Soon we were back in the proper ascent gully, looking up at the complex terrain and wondering what we were in for. As it turns out – not as much as we expected. Huge, blocky terrain – you don’t want a large scattered group here. 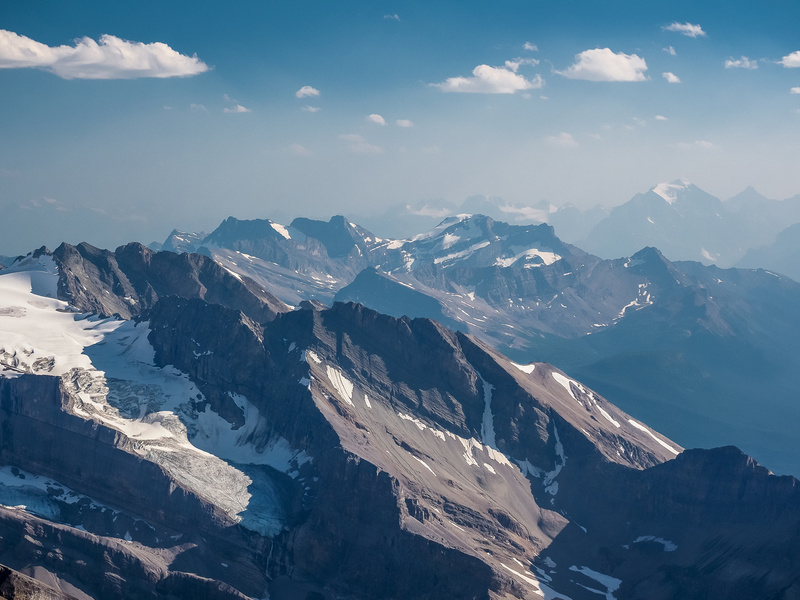 There are some recognizable key landmarks that can be used to keep Cataract Peak an easy alpine objective. The first is ascending the correct bottom scree / slab gully (if you’re lucky you’ll have snow like we did). 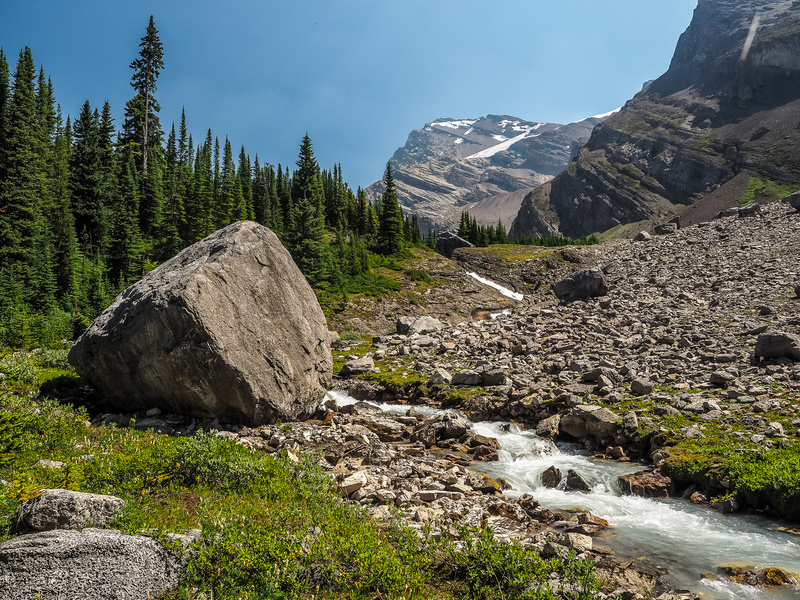 The second is an ascent along a striking slabby watercourse leading to a light colored scree and boulder bench which is followed north (climber’s left) to the end of a ridge that runs along the top of this bench, blocking direct access to the glacier above it. 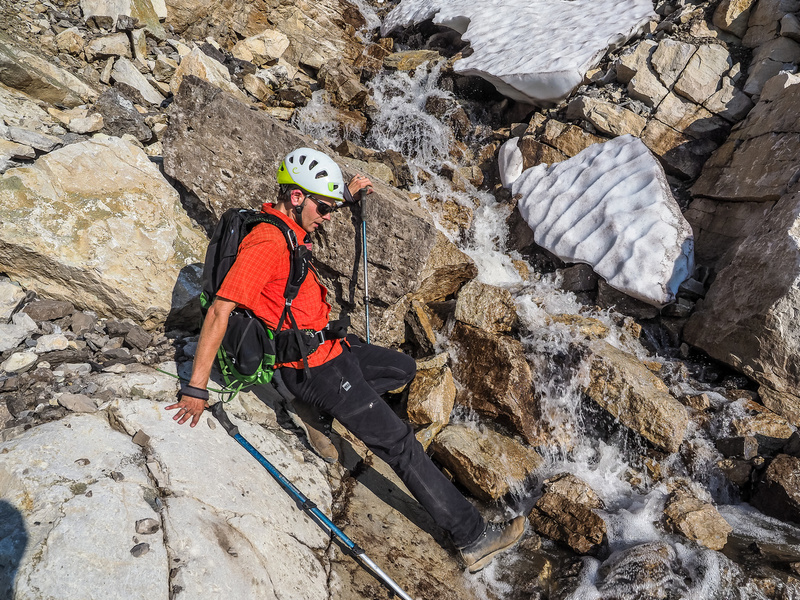 I managed to have great fun on slabs to climber’s left of the watercourse in my light approach shoes, while Phil felt safer on less slabby terrain nearer the water. 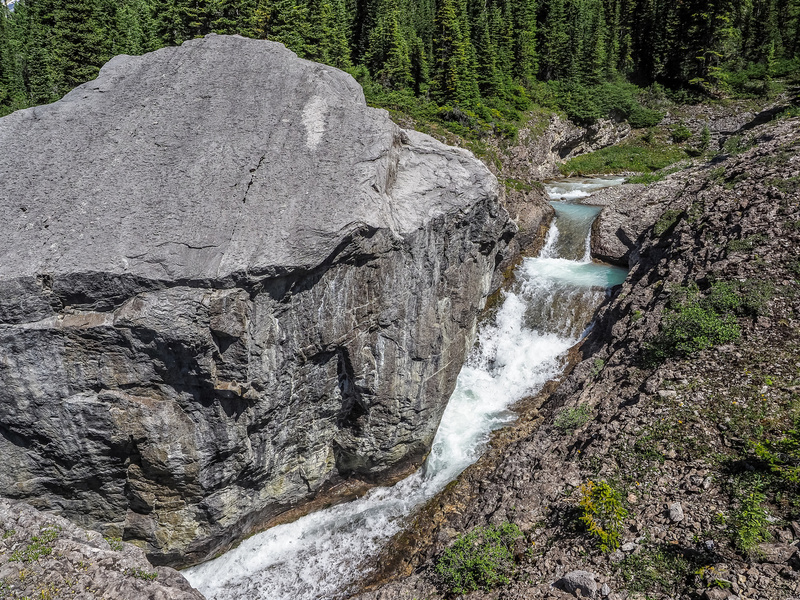 There are some huge light colored boulders (visible from the bivy already) that are perfect landmarks on the boulder bench traverse which is on blocky or slabby terrain depending on your preference. There is no scrambling above the ‘moderate’ level up to this point, although there are some exposed sections that would be much harder with snow or ice on them. Looking back at Phil as we near the end of the first traverse. Note the loose, light colored blocky and bouldery terrain. After ascending easily past the first traverse, there is a small, receding glacier that can be easily avoided along its bottom edge. 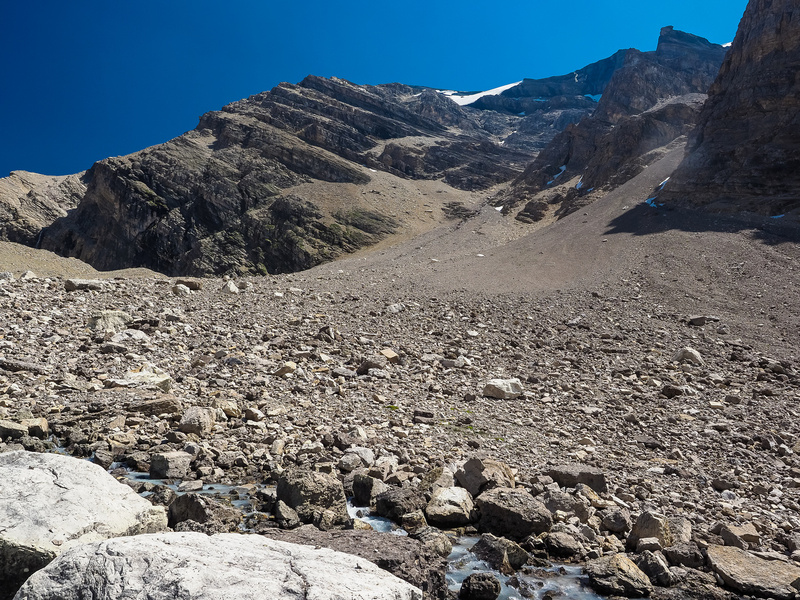 This glacier has receded significantly since the route was first published around 1988 by Graeme Pole. We didn’t avoid it on our ascent and ended up finding some crevasses and descending around them. No point flirting with these objective hazards if you don’t have to. Finally we found ourselves staring up at the innocent looking, infamous scree bench that gives nontechnical access to the summit of this lofty peak. 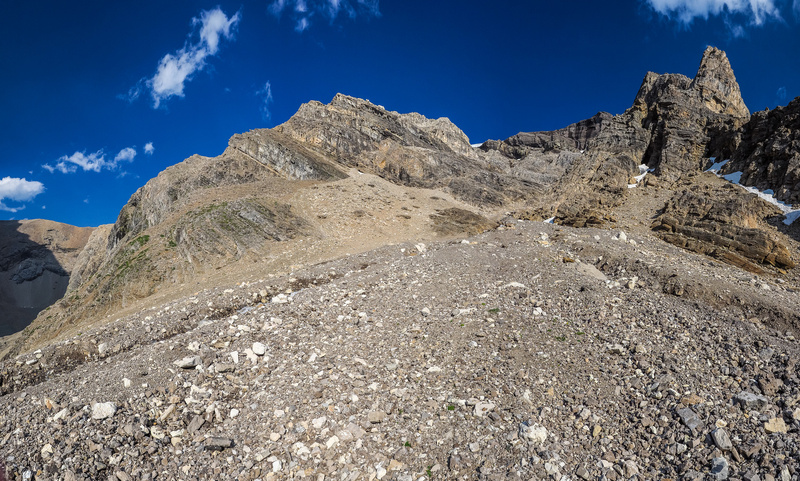 I have never been on a more foreshortened scree slope! This thing honestly never ended. Part of me is still up there, fighting my way along it. The surprising thing was how incredibly loose parts of this interminable slope were and how traversing near it’s bottom was much firmer and quicker but also much more exposed to the cliffs running underneath it. 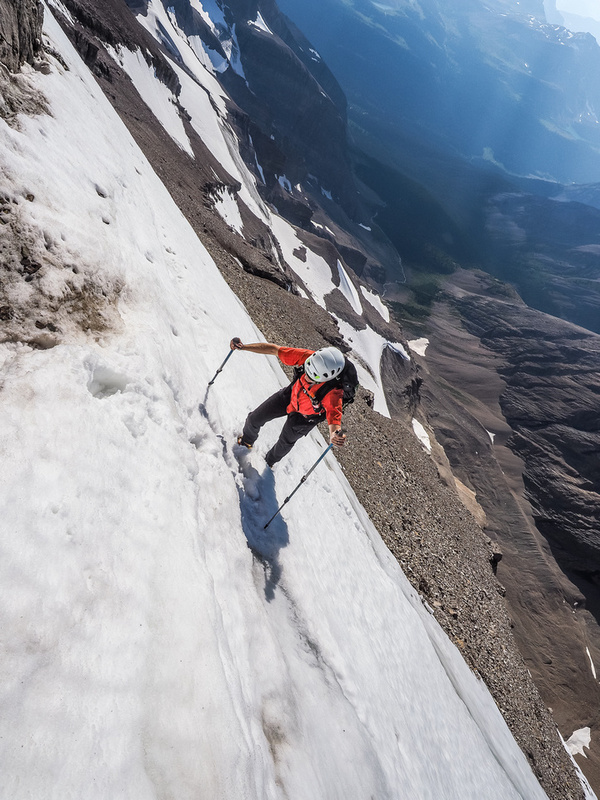 There’s no doubt that this slope would be less suffering with snow, but it would also feel much more exposed. Of course, we were getting a wee bit tired at this point too. 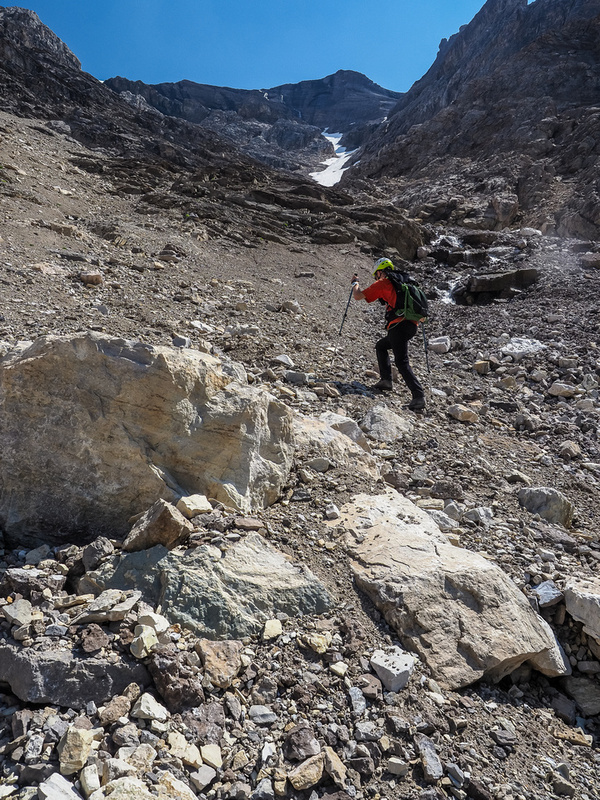 We were over 9.5 hours into our day already with at least 400 vertical meters of loose scree to go yet – and the unknown snow / ice patch loomed ominously in the back of my mind. Looking at the rest of our ascent. 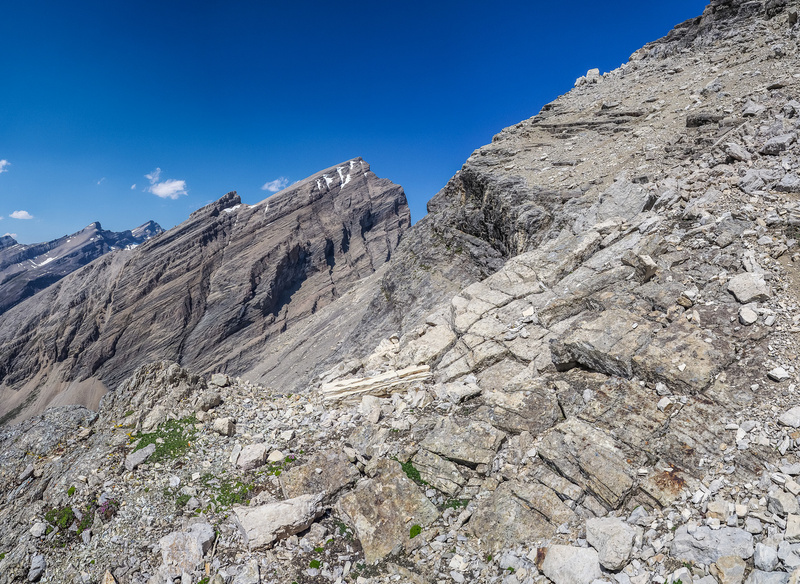 The small glacier at center and the extremely foreshortened scree bench at upper center trending left. There’s at least 400 vertical meters left at this point. It took almost an hour to grovel the 300 vertical meters up the scree bench but we managed it somehow. The views of “Little” Cataract to the north kept us distracted, as did the swearing and the pain every time a loose rock bashed against my poor ankles (remember I was in light approach shoes). Finally we found ourselves blocked by the small patch of snow / ice just beneath the summit – it was time to see if our minimal equipment would get us up and over this final obstacle. 10.5 hours, 2300 vertical meters and around 25km from the parking lot, we could easily be turned back only minutes from the top at this point. Thankfully, we weren’t. After donning crampons and starting up the icy bottom of the small snow field I knew immediately that without my ax I would have been turned around here. Aluminum crampons are extremely crappy on ice. There was only a few feet of ice before the slope changed to slushy and then to proper snow – that was another huge relief. Phil had better crampons but struggled a bit with no ax. 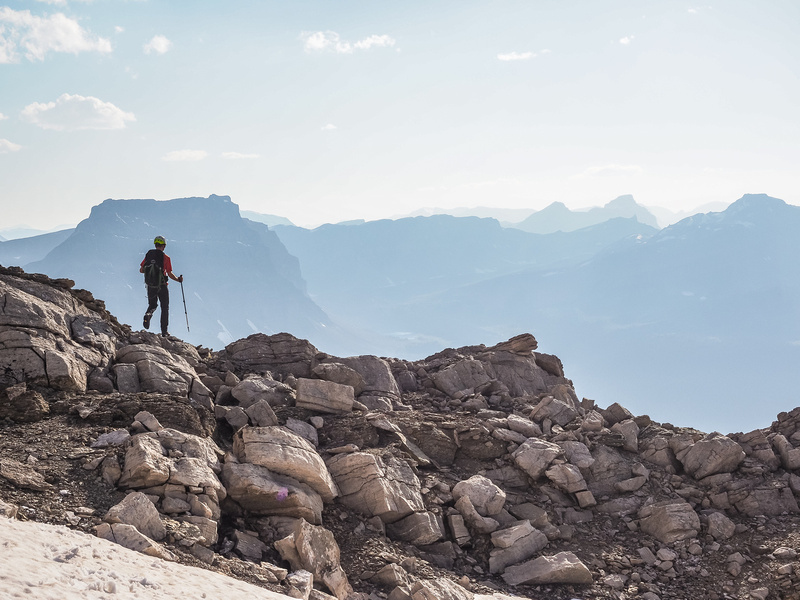 Our minimalist gear mindset almost bit us on this trip – but it didn’t. I traversed out along the top of the slope towards distant scree while Phil found a better route up to another bench just above this spot. 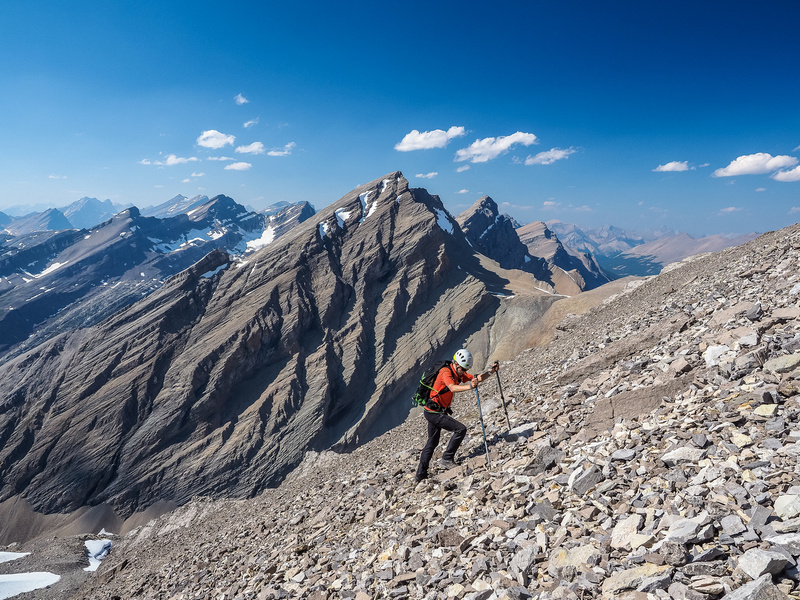 Sticking climbers left on the scree bench presented some slightly more solid footing but exposed me to the cliffs below – usually not an issue but on the loose terrain where cascades of scree could come down at any moment, there were a few moments of quiet desperation. 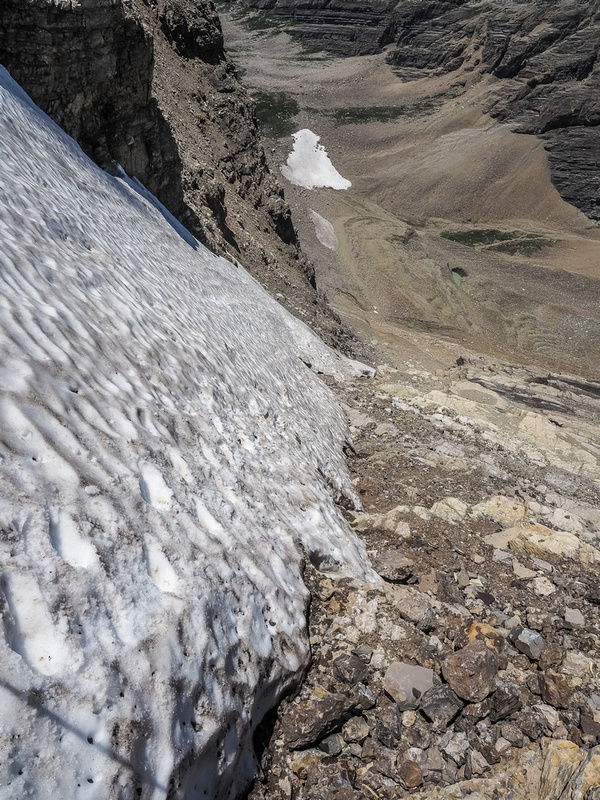 After a few pretty exposed moves across the top of the snow / ice slope I was happy to exit back onto scree. Phil was on another bench just above me and we both topped out on the summit ridge to some pretty spectacular views in all directions. 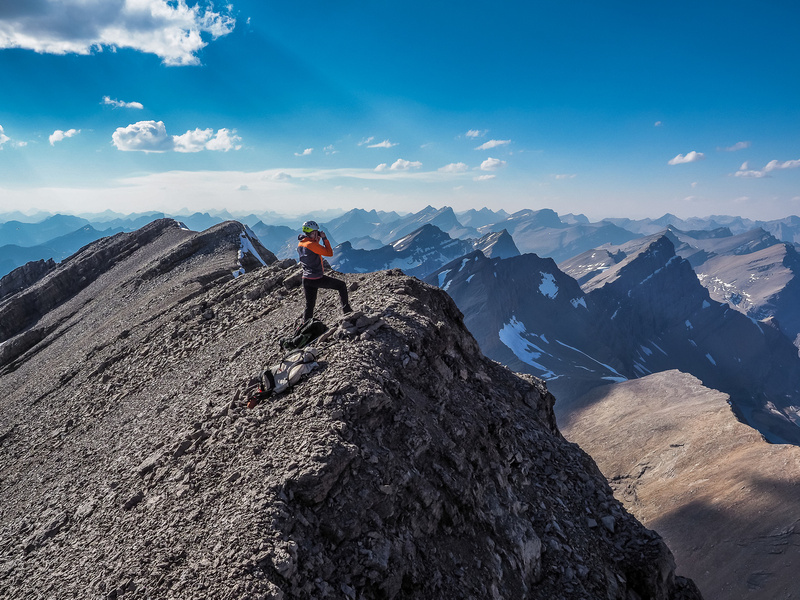 It had taken us around 11 hours, 2400 vertical meters and 25km of hiking and scrambling from the Mosquito Creek parking lot to stand on the lofty summit of Cataract Peak. We were delighted with some of our views towards interesting peaks and rarely visited tarns and lakes in the area. Thanks to all the forest fire smoke, the views west were quite limited, but despite the haze they still had an ethereal quality about them that I liked. 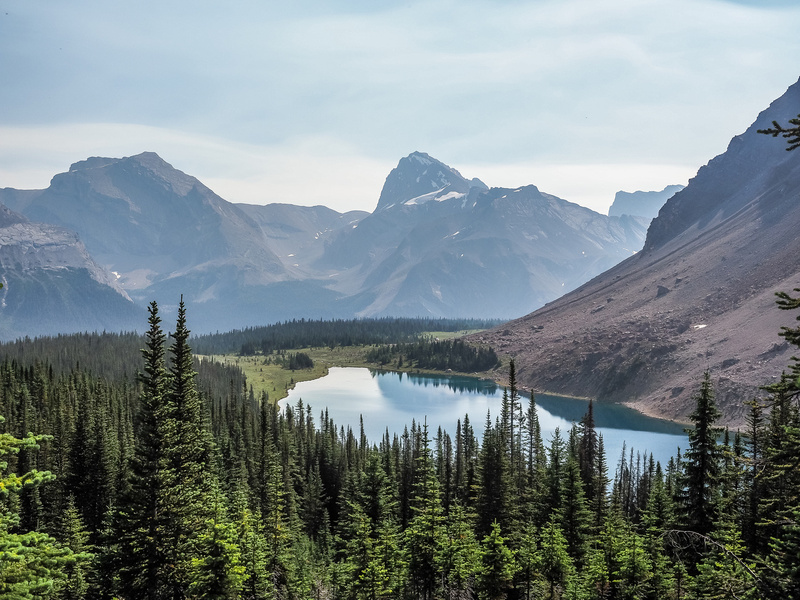 Clear, unlimited mountain views can get similar after a while – I didn’t mind the different look for once. 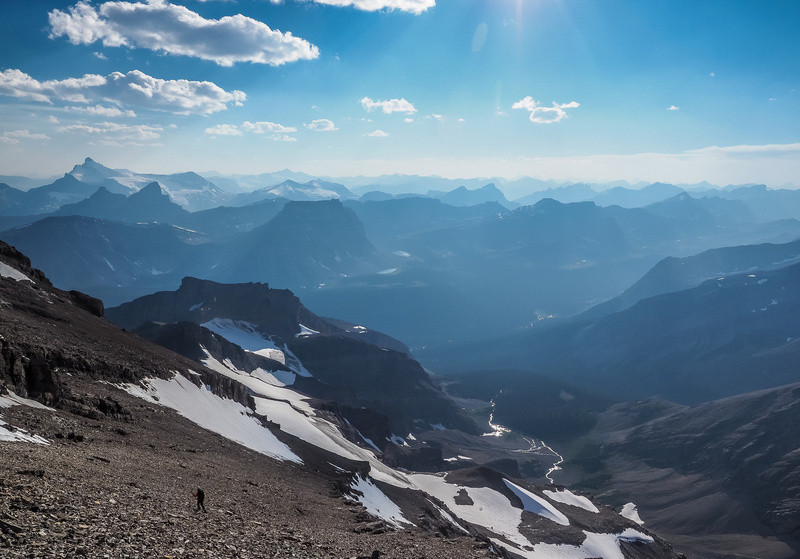 The important views were more to the north and east of the summit – towards unknown (to us) summits like Deluc, Little Cataract, Snort, Bleat Peak and Mount McConnell. 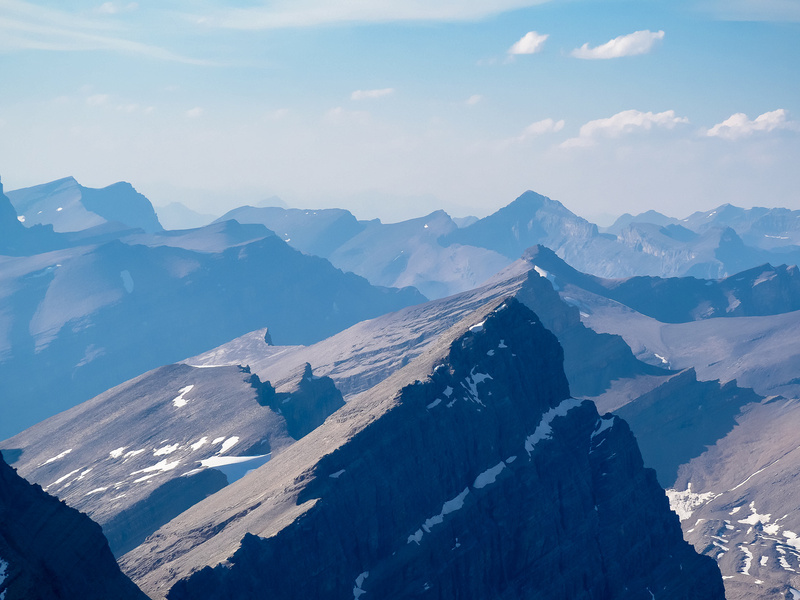 There are quite a few summits over 3,000m in this area of the Rockies. After taking in the views and enjoying a beautiful evening calm on the summit, we reluctantly turned our attention towards the descent. Left is looking north down the Roaring Creek Valley lined by very obscure summits such as Deluc, Dip Slope and Smoky Mountain. At center is the McConnell Creek Valley which is lined by beauties such as Snort, Bleat, McConnell and Boar Station. 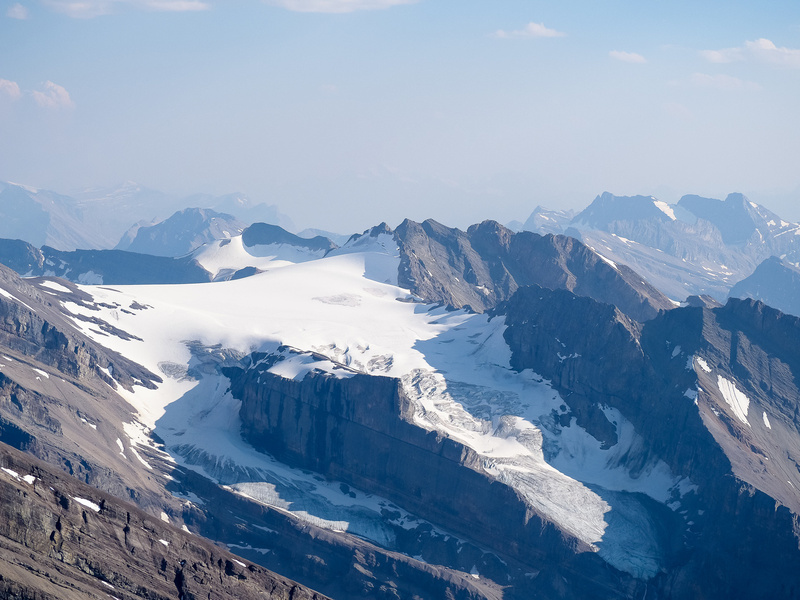 At right is the Drummond Icefield and Mount Drummond itself. An old register with few entries. First ascent in 1930, second in 1988! 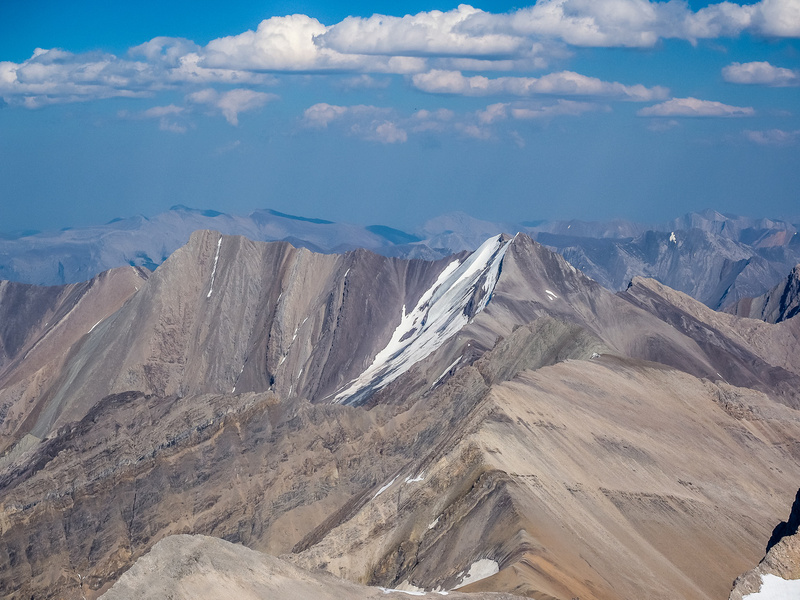 Late evening views at almost 11,000 feet on a remote Rockies peak. What could be better? This is looking down the Pipestone River Valley. We used Phil’s route to the top of the snow field and delicately, if somewhat awkwardly, tiptoed down it. The advantage to this route was that even a slip on the ice wouldn’t have killed us. My ascent route was much more exposed and needlessly finicky compared to the one Phil found. After the crux, the rest of the descent was quick and straightforward thanks to the key landmarks we’d noted on our ascent. The scree bench was extremely quick to descend. We skirted the glacier lower down and found that the nose of the ridge just to its NW was even easier than our more ascent line over top of it. 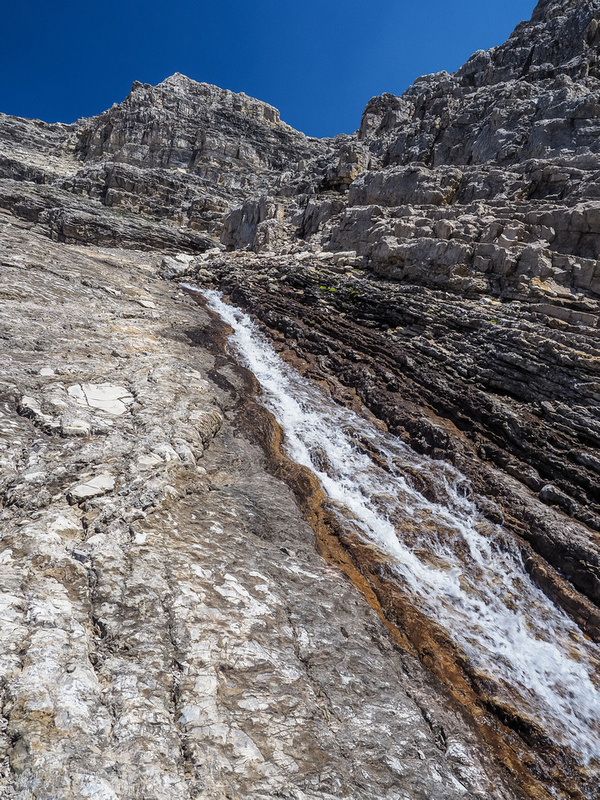 From here we descended past the light colored boulders down the first scree / boulder bench to the slab watercourse. From there it was sliding and plunge-stepping down snow in the gully before exiting at the lower boulder field and wandering towards our bivy on the grassy ridge overlooking the valley below. We enjoyed a lovely few hours of light before turning in – contented and exhausted from a long and very successful day. A very well-deserved break at camp! 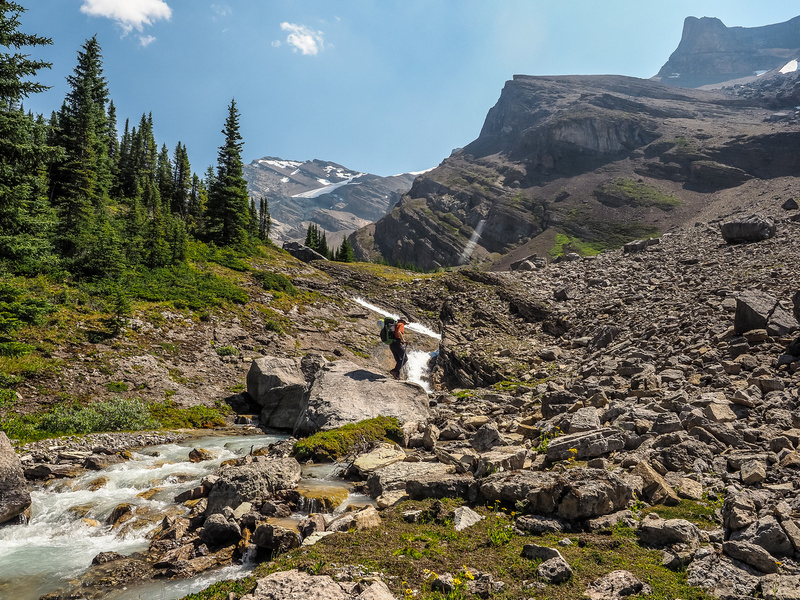 The next day we looked forward to another long, but easy, hike back along our approach route and up to Molarstone Peak. 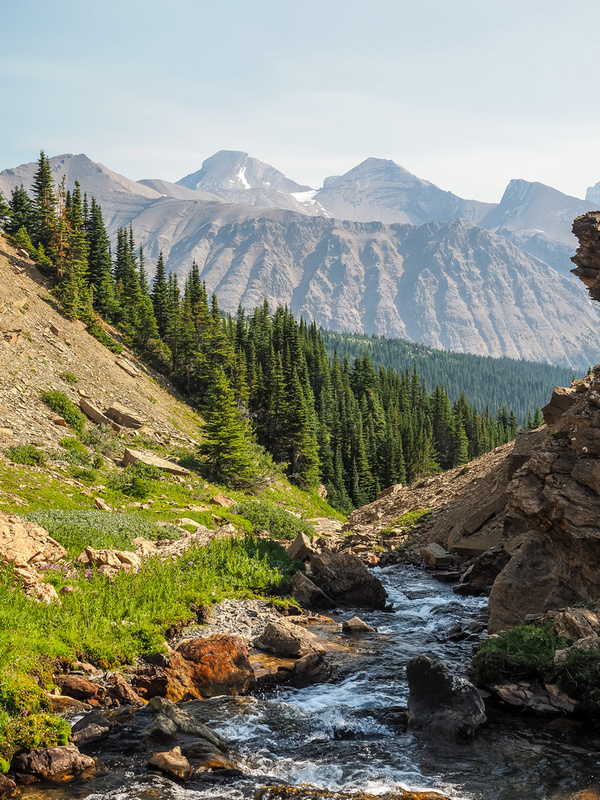 Cataract Peak looms over the stream from just beneath our bivy ridge. The obvious scree gully beckons us onward. The gully granting access to the west face and summit of Cataract. Looking down a convenient snow patch in the lower gully. An obvious key landmark - the slab watercourse. Huge, blocky terrain - you don't want a large scattered group here. Phil gets ready to cross the drainage as we will start our first traverse out of sight to the left. Looking back at Phil starting the traverse and over our approach valley, far below us already at center. Looking up the blocky ramp - note the boulders at upper right on the skyline and the exposure down to the left. Coming over the ridge (on descent we went down and around the nose you see here at center), looking back at the impressive "Little" Cataract. 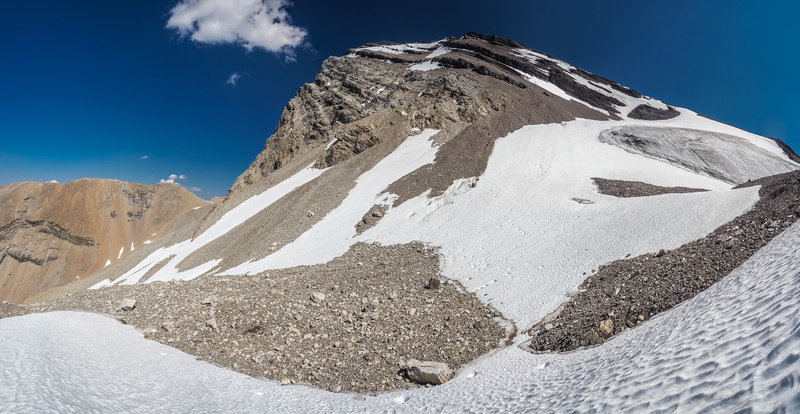 The small glacier at center and the extremely foreshortened scree bench at upper center trending left. There's at least 400 vertical meters left at this point. 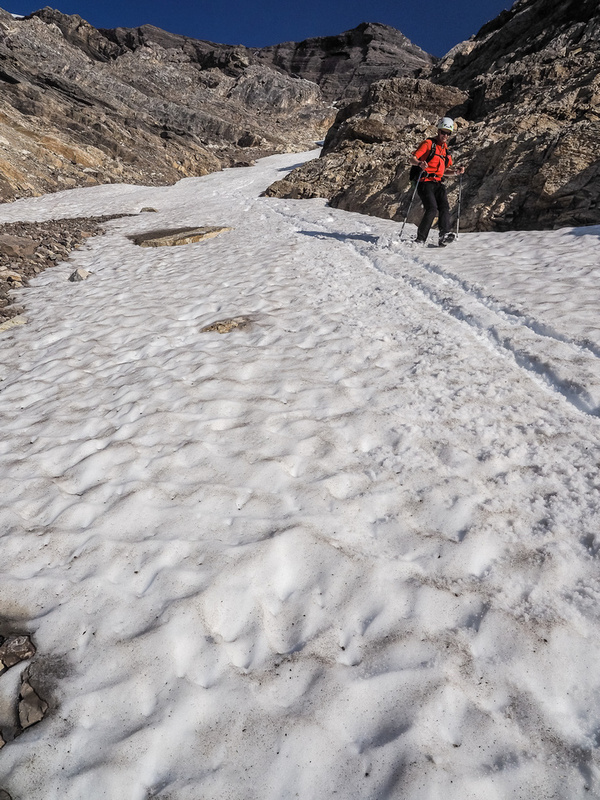 On ascent we utilized the glacier until running into some crevasses. Let the trudge begin! 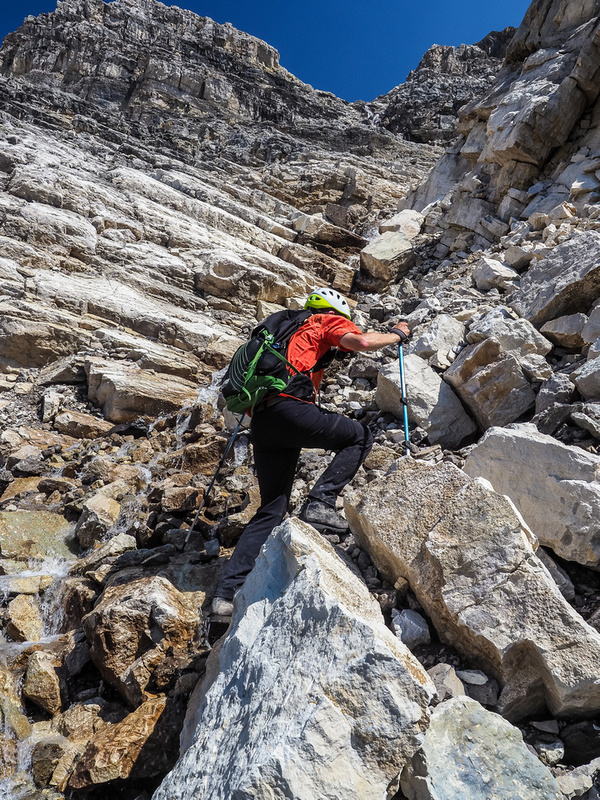 Phil is determined to kick the hell outta this scree slope! Starting to get glimpses into the very remote and rarely traveled Roaring Creek Valley. We are now higher than any of our neighbors. Hector showing up at distant left. It's hard to see on this shot, but looking back along my traverse over the snow / ice patch you can see that it is runout to cliffs below. 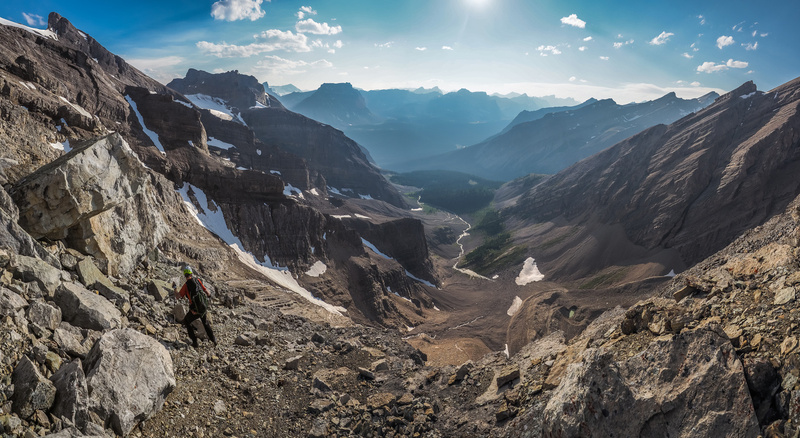 Phil traverses towards the summit with this stunning view north over the Roaring Creek Valley. 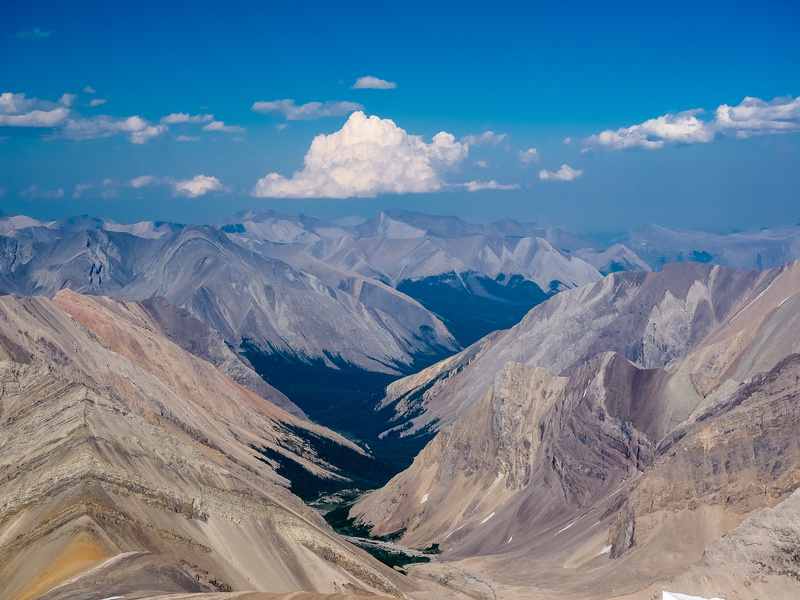 Looking north down the Roaring Creek Valley - note the dark colored tarns at bottom. Left is looking north down the Roaring Creek Valley lined by very obscure summits such as Deluc, Dip Slope and Smoky Mountain. Phil can't believe he's finally sneaking a peak down the Roaring Creek Valley. 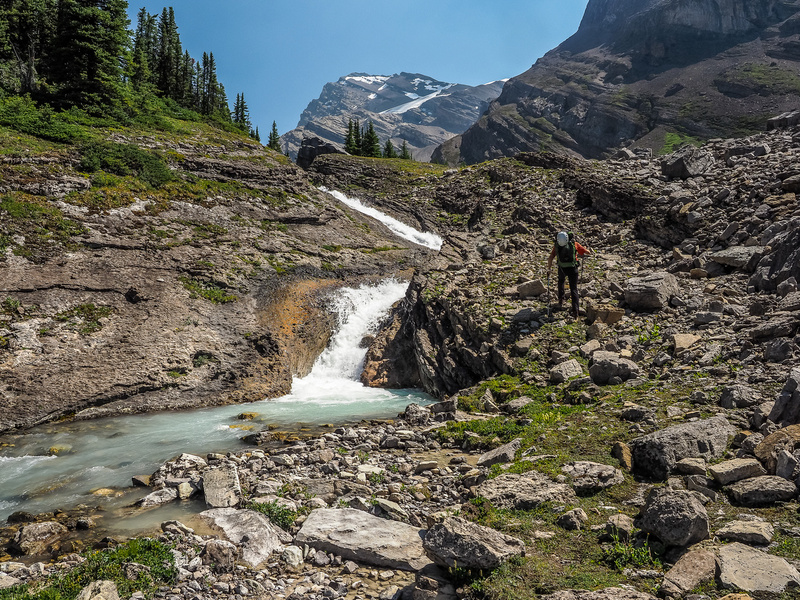 Source tarns for Roaring Creek. 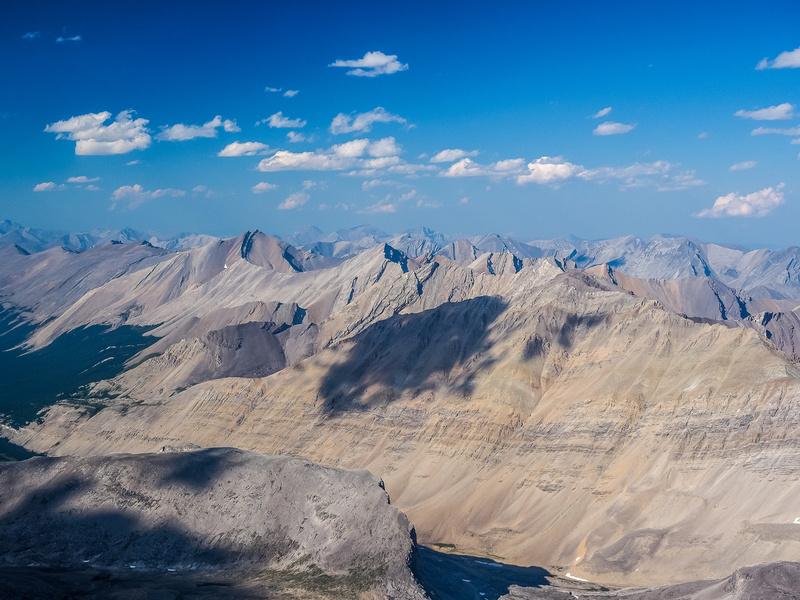 Looking over Cyclone Mountain (L) towards Richardson, Pika and Ptarmigan in the Skoki area and Mount Temple in the smoky haze at distant right. Douglas and St. Bride at distant center. Mount McConnell is over 3100m. 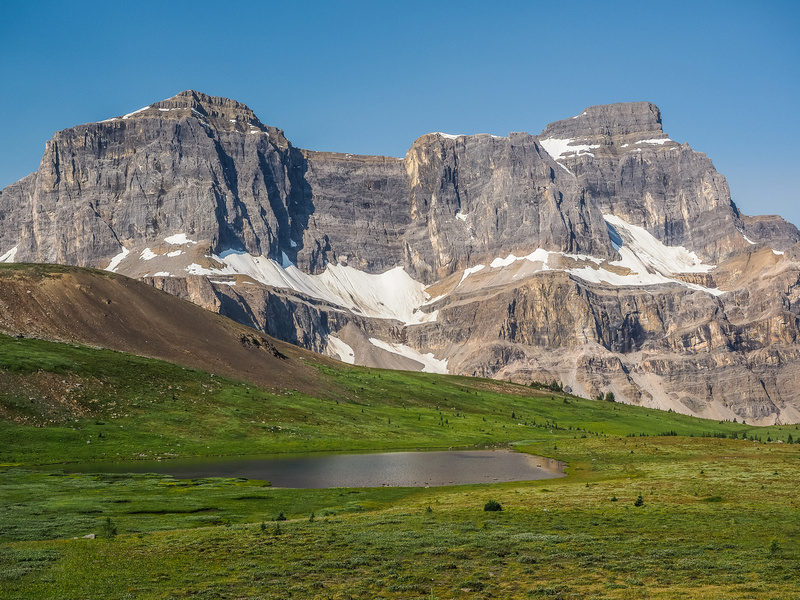 Lying NNE of Cataract are Snort (L) and Bleat (R) Peaks - both near or over 3100m. A telephoto down McConnell Creek leading towards obscure peaks such as Boar Station. Fish Lakes at lower right, almost out of the photo with Andromache rising over the unofficial "Minnow Peak" in the foreground. Mount Hector looms up behind Molar Mountain. 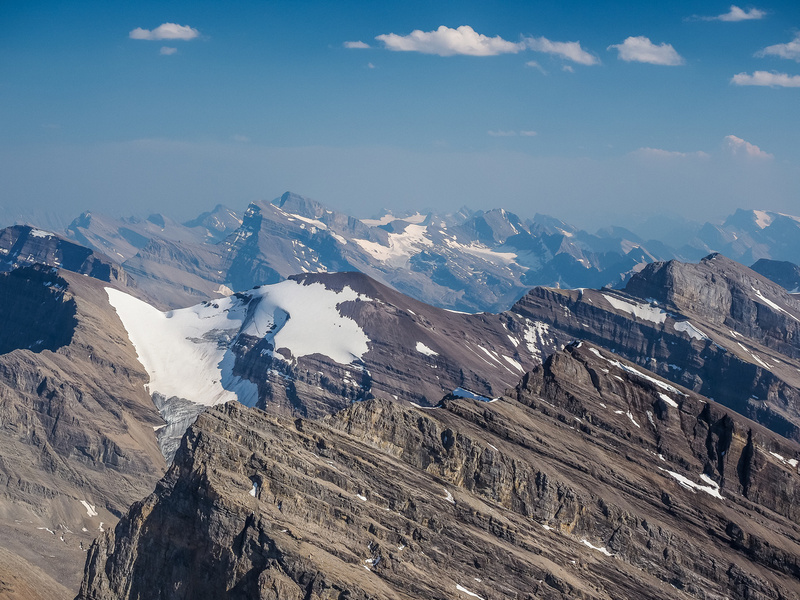 The Drummond Icefield and Mount Drummond at left and Mount Hector and Molar Mountain at right with the Pipestone River Valley running out at center bottom. The shadows are growing long over the Roaring Creek Valley as we reluctantly think about heading back down to our bivy. Phil is tiny on the summit ridge as he descends. Willingdon rises in the distance in this view north. Deluc Peak is almost 3200m high. Icefall - at distant right of center - is even higher at over 3220m. Heading down the upper bench above the snow field and above the "proper" scree bench. Delicate downclimbing on the snow / ice slope that blocked our easy path to the summit. 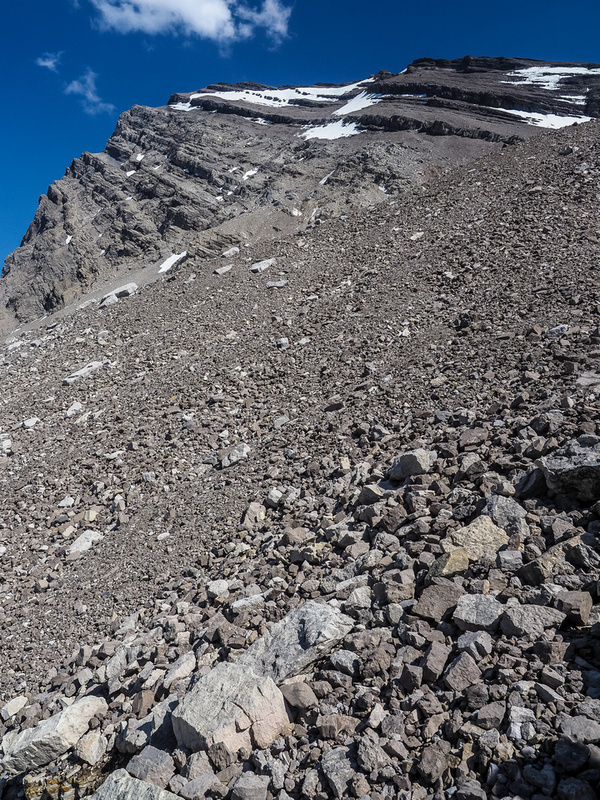 A very fast and enjoyable scree run down the upper scree bench. Nearing the glacier with great evening views over our bivy and approach valley. Crossing the ridge to the lower scree / boulder traverse. 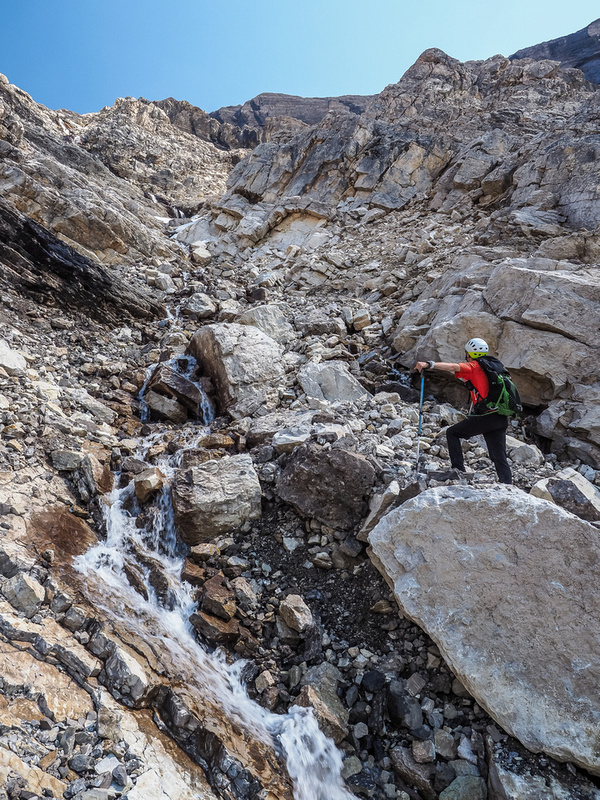 Descending carefully past the large, light colored boulders. Lots of runout exposure below us here. Back on ledges / scree above the slabby watercourse. These slabs were tons of fun on ascent. On descent I chose the scree at left. Some awkward moves to get into and across the slabby watercourse. 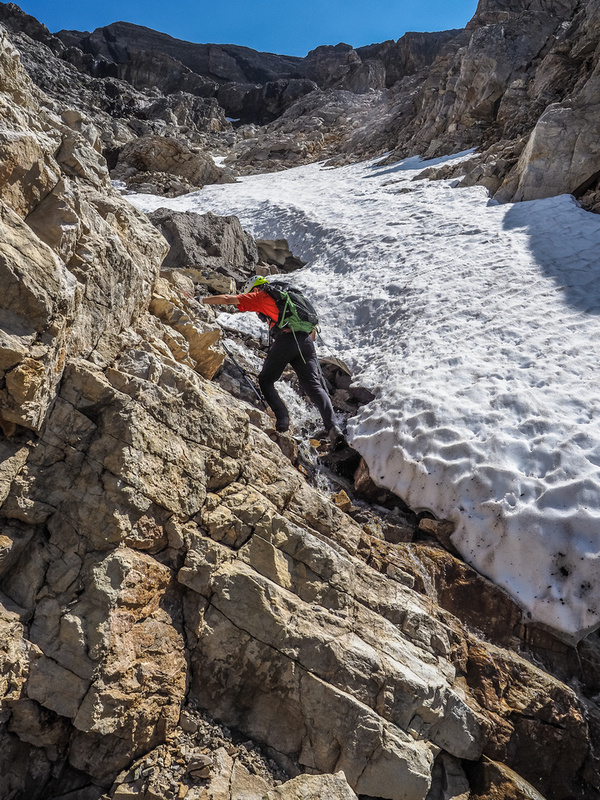 A delightfully quick descent utilizing the snow in the lower gully. Looking back up at the foreshortened lower ascent slopes from near the bottom of the approach gully. Late evening soft light as we approach our bivy site. 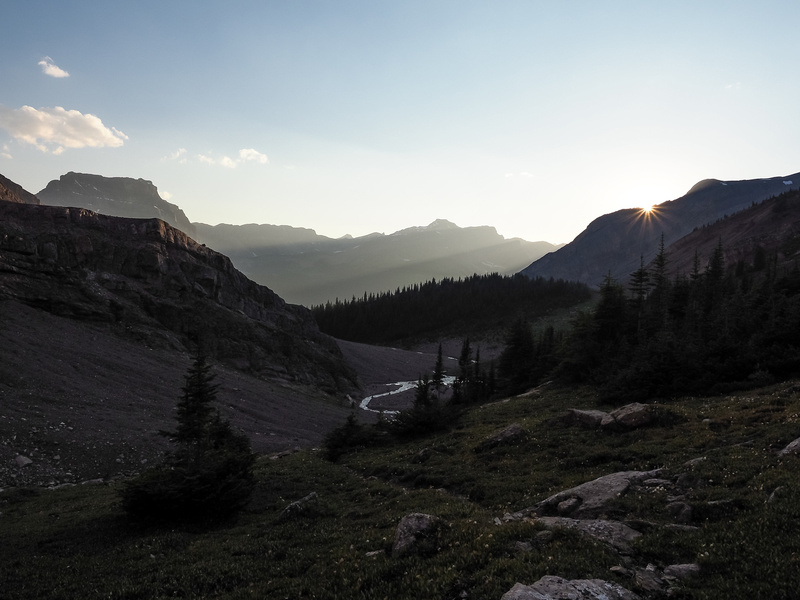 The sun sets over distant mountains in this view back down our approach valley from the bivy.